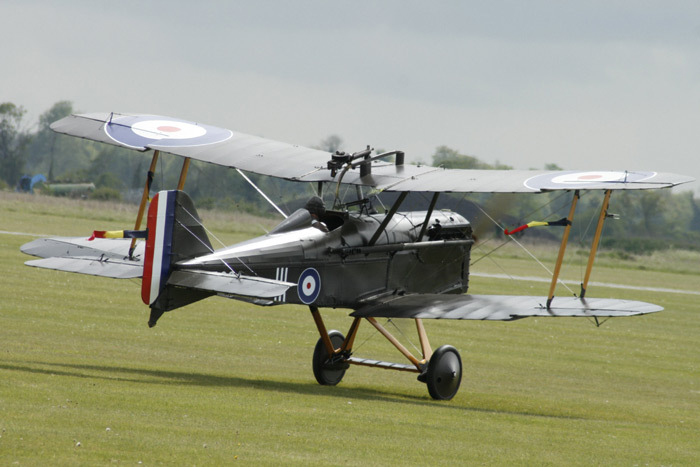 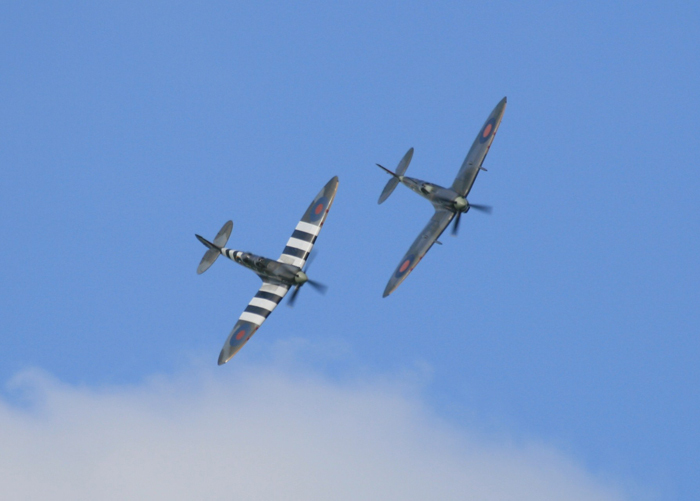 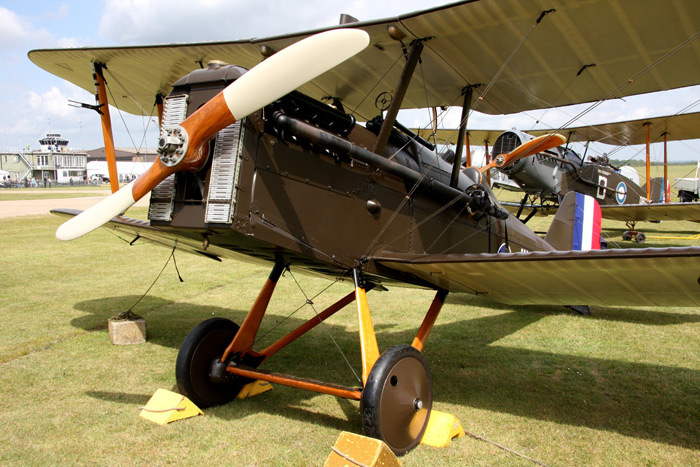 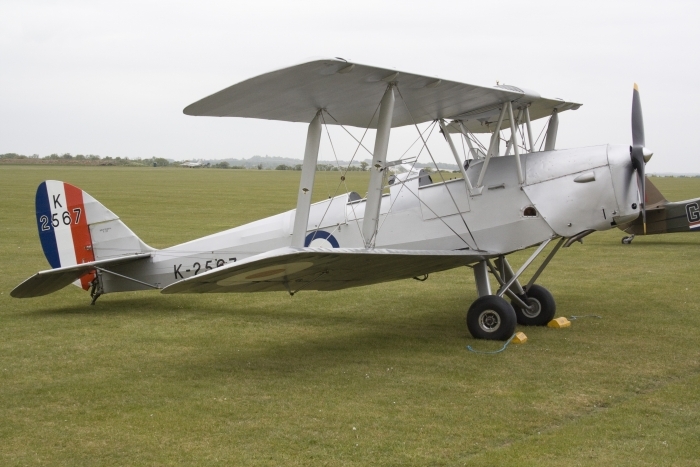 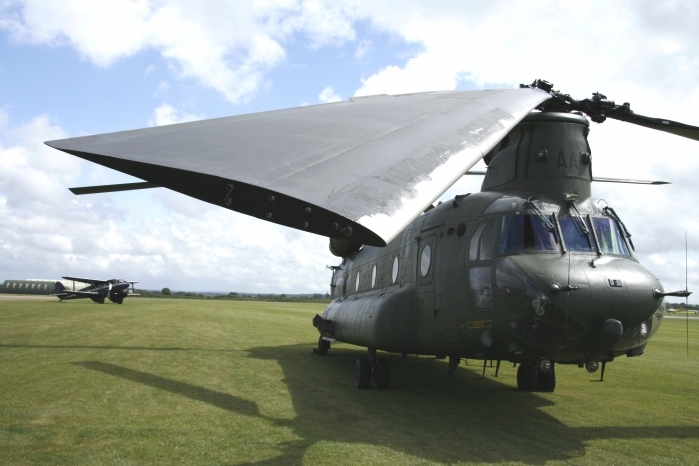 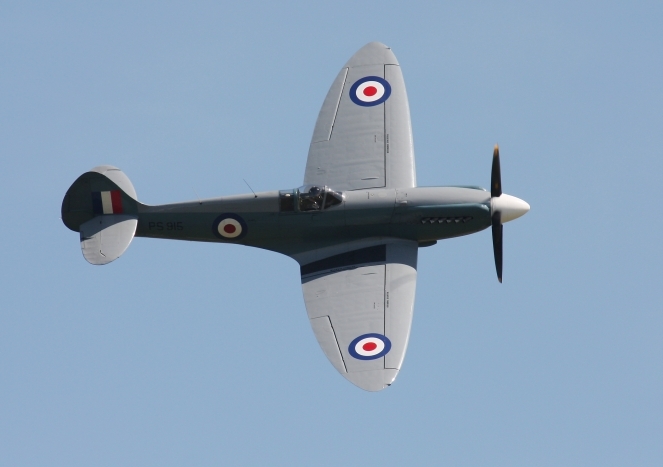 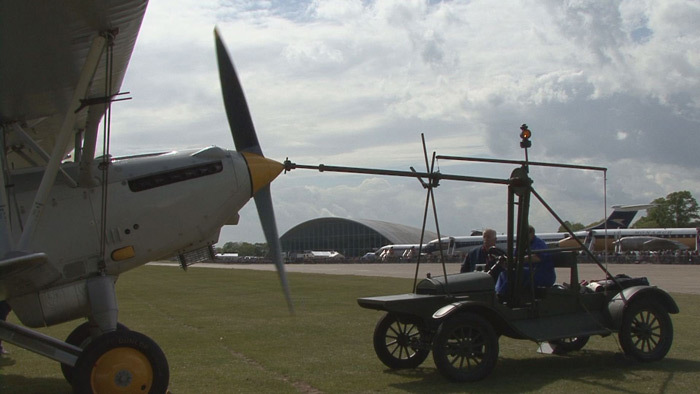 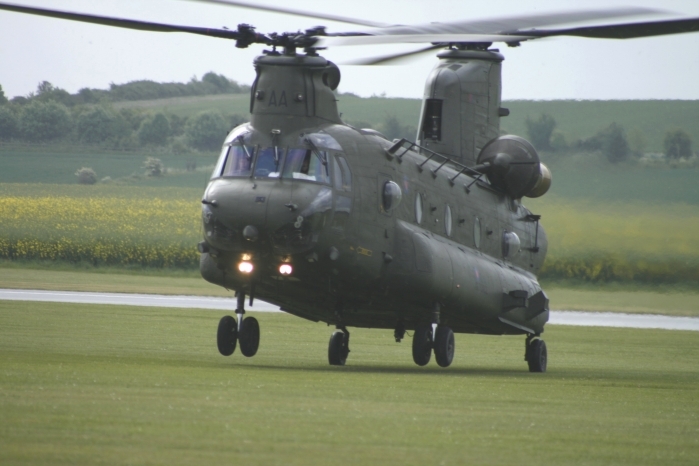 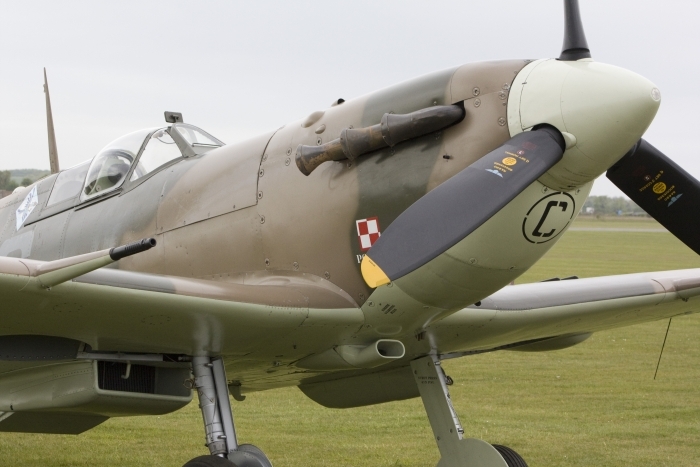 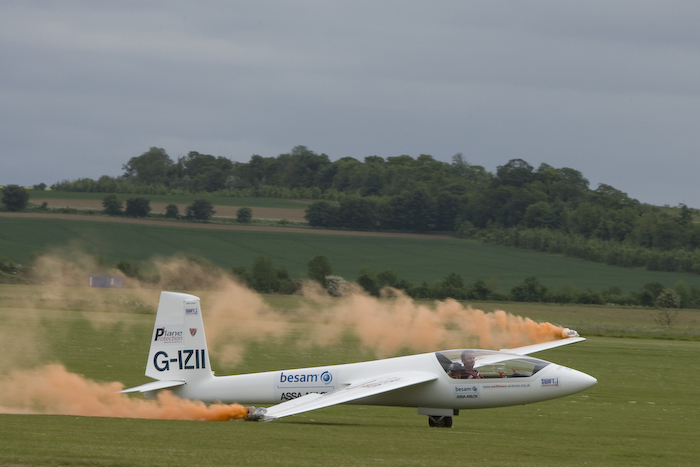 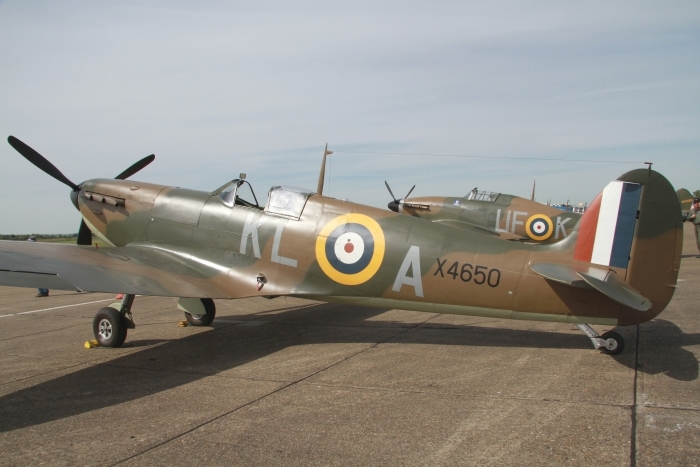 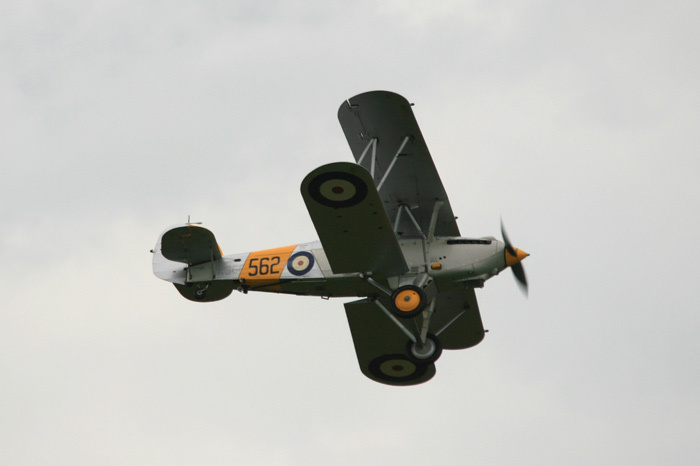 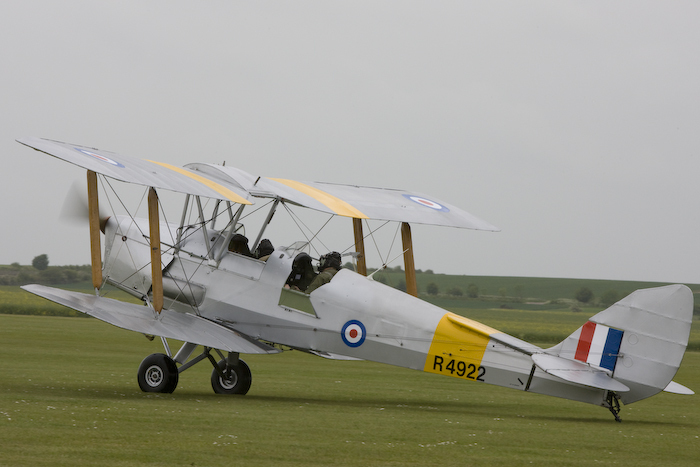 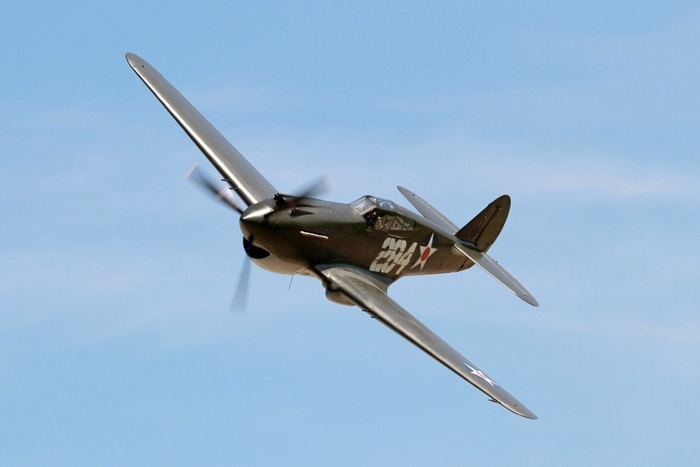 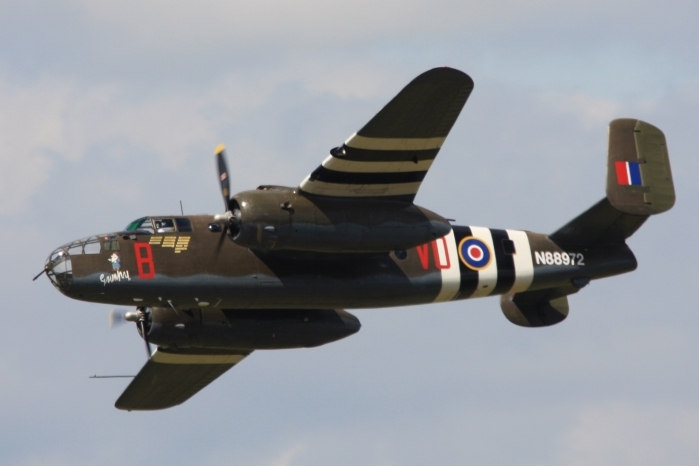 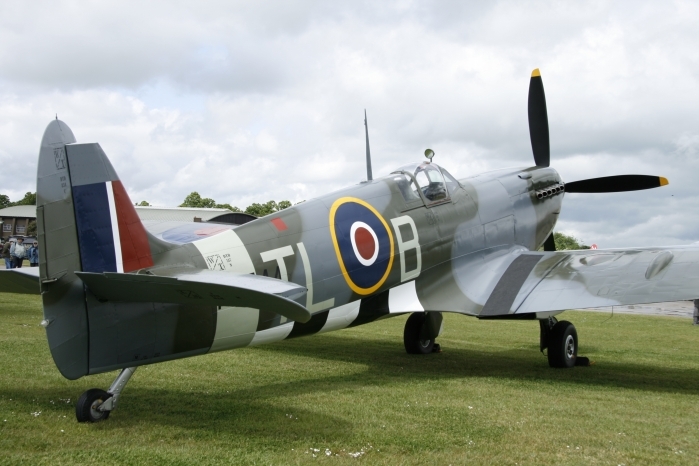 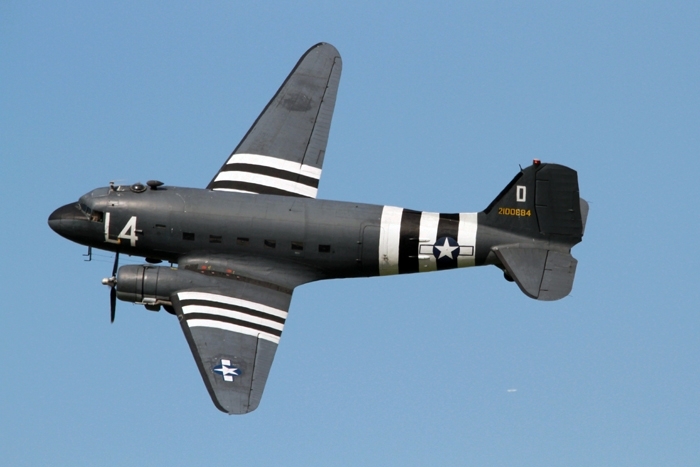 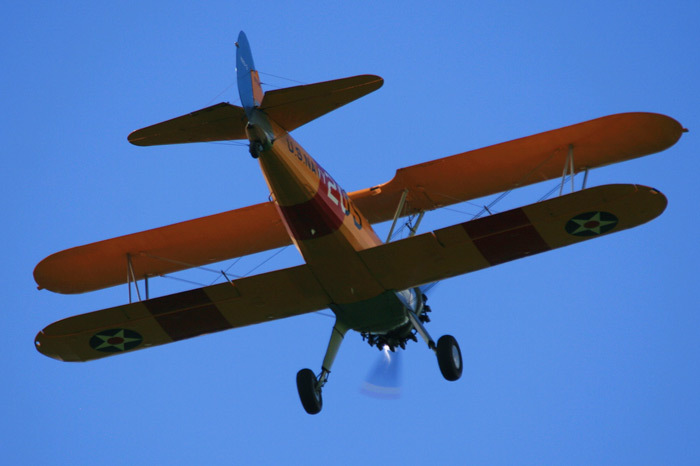 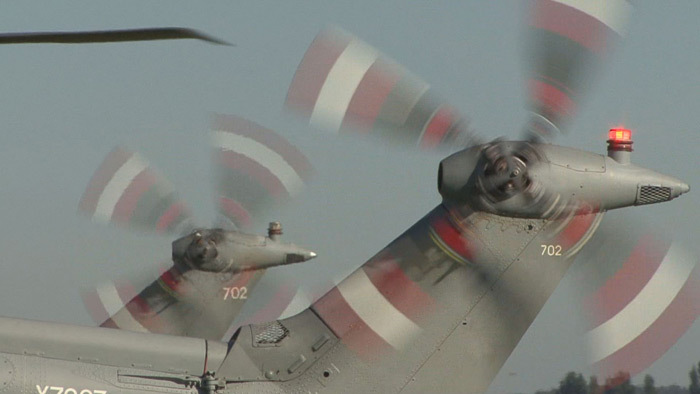 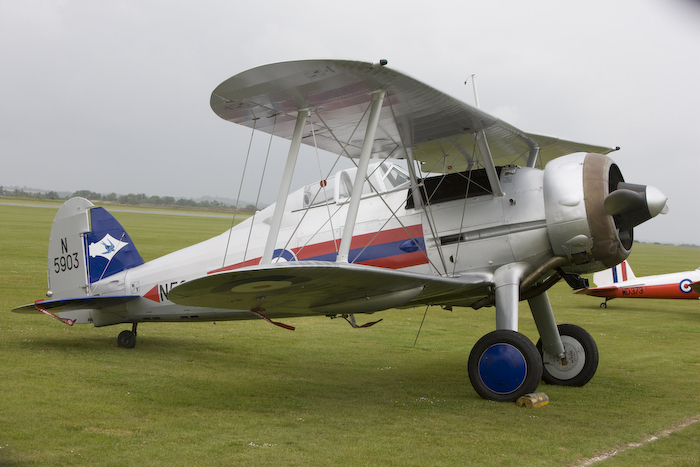 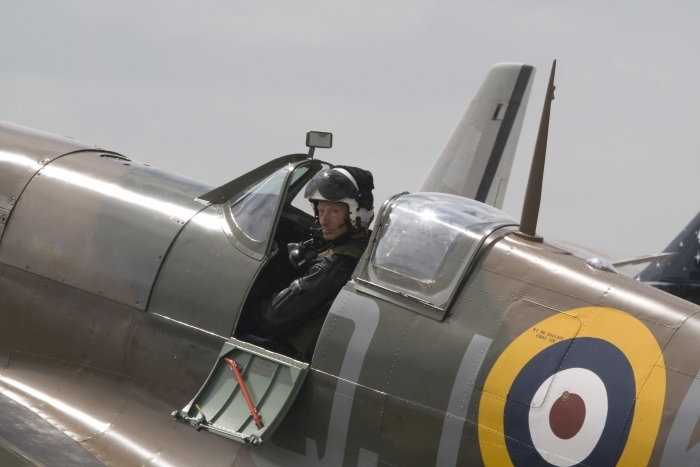 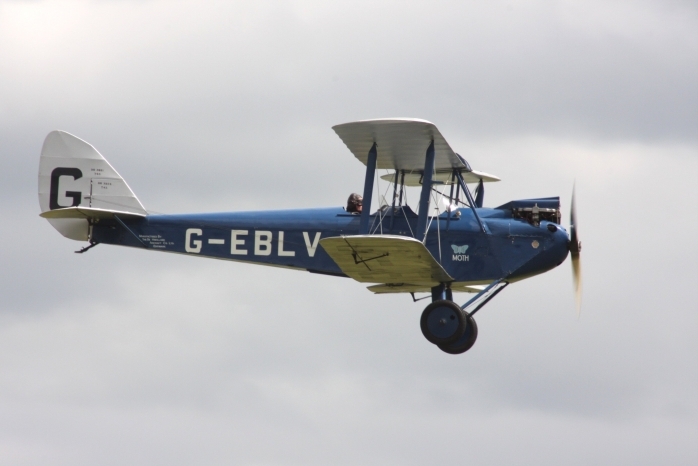 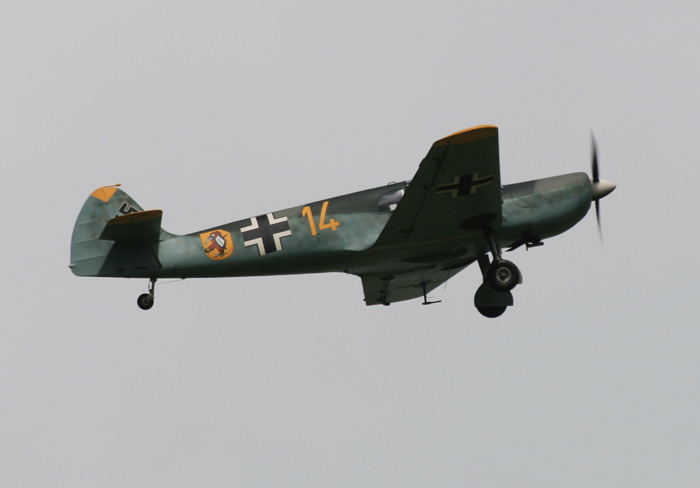 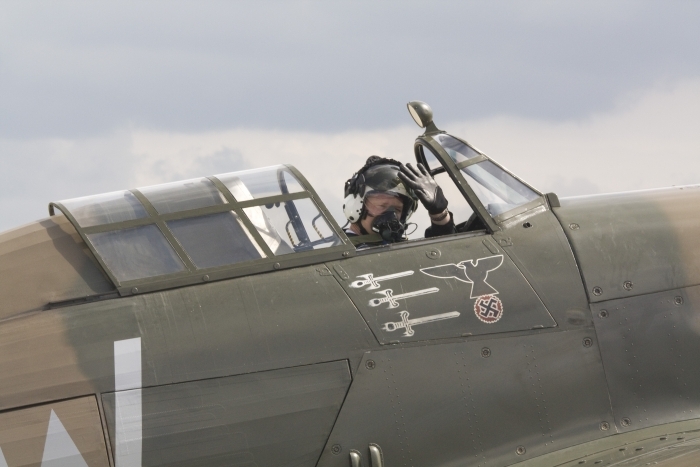 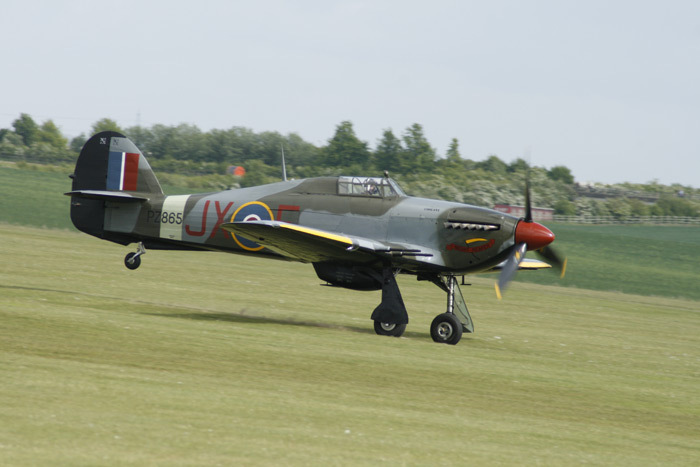 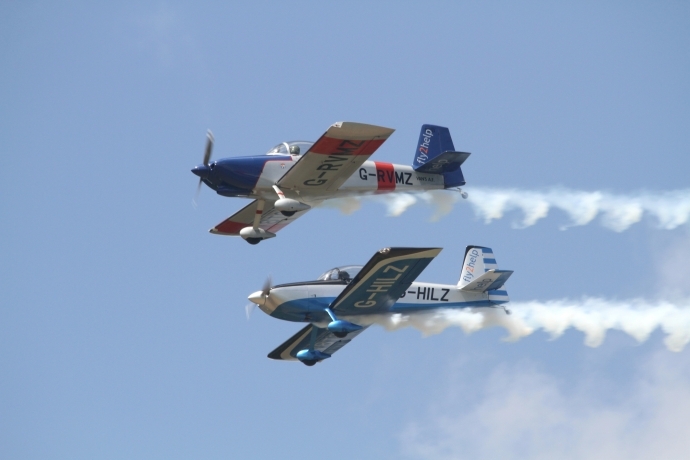 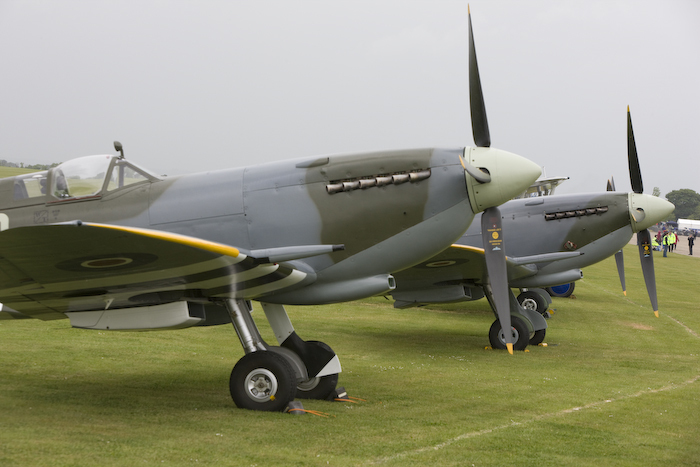 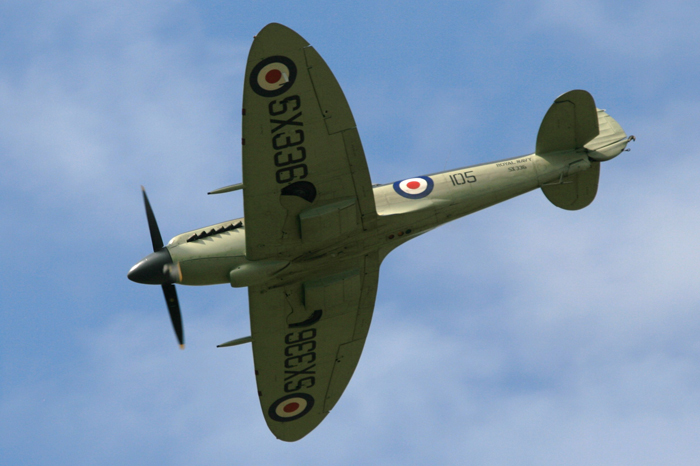 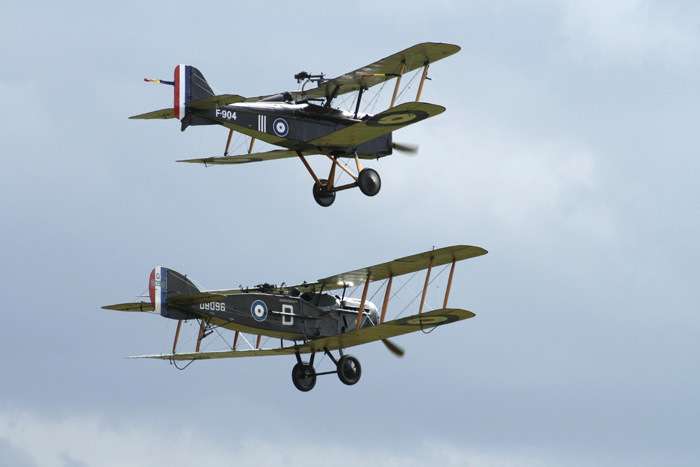 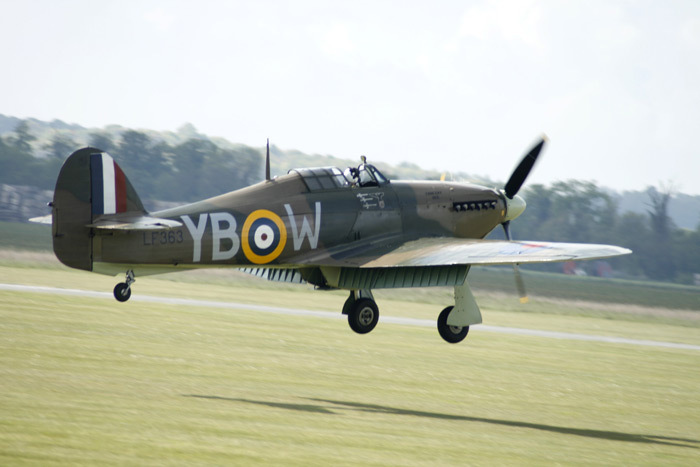 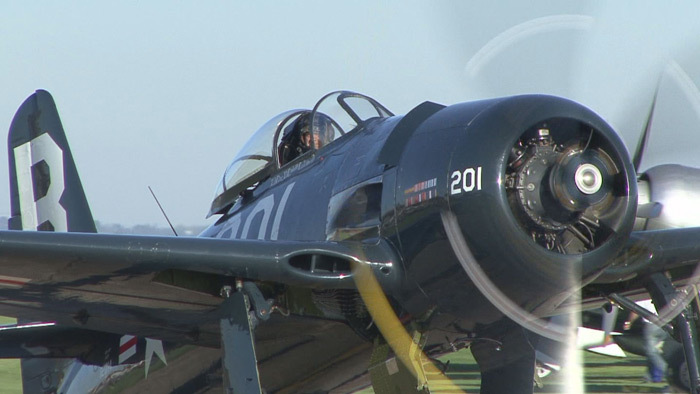 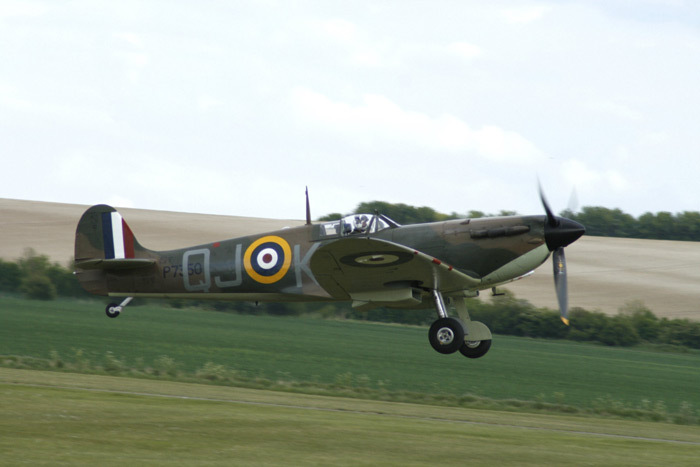 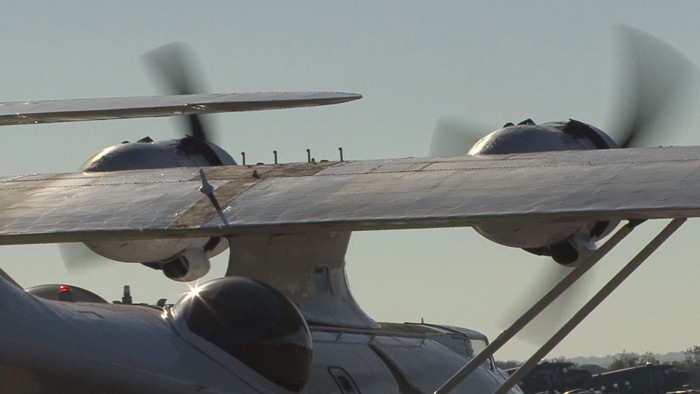 Duxford's Spring Air Show held every year during May is the season's opening air show. 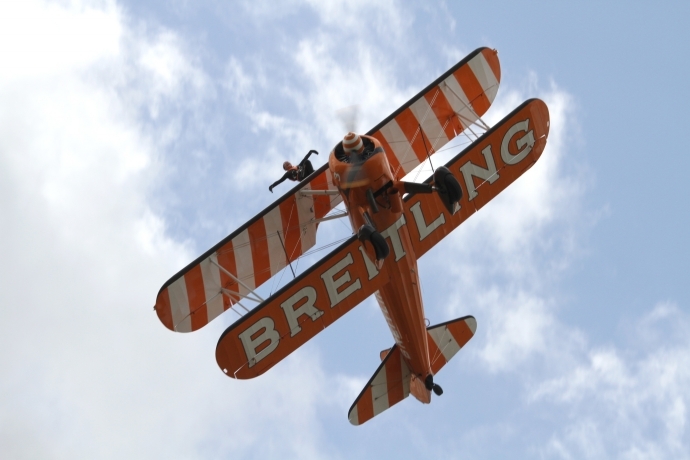 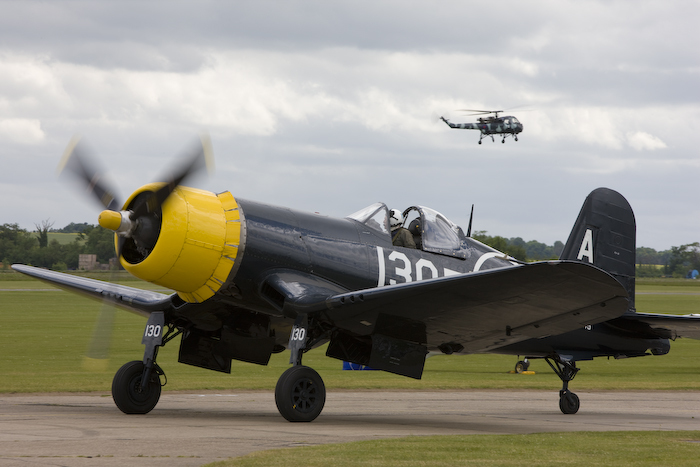 The Duxford Spring Air Show includes sensational aerial displays from historic aircraft, through to more modern aircraft from the RAF. 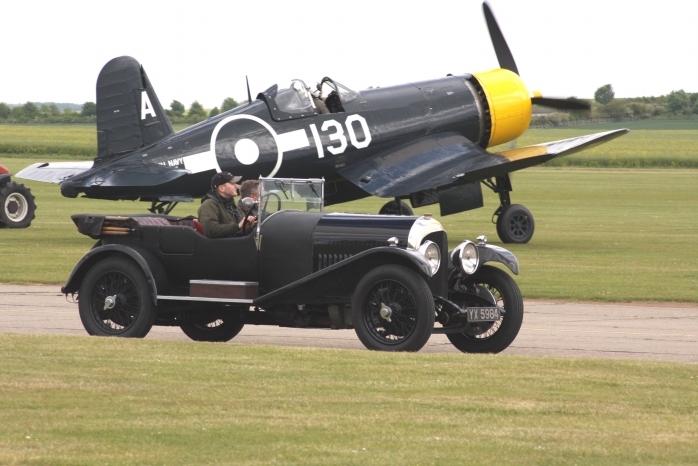 There are plenty of activities to join in throughout the airfield which are suitable for all ages, also stalls and refreshments and as usual the museum hangars at Duxford are open for viewing too. 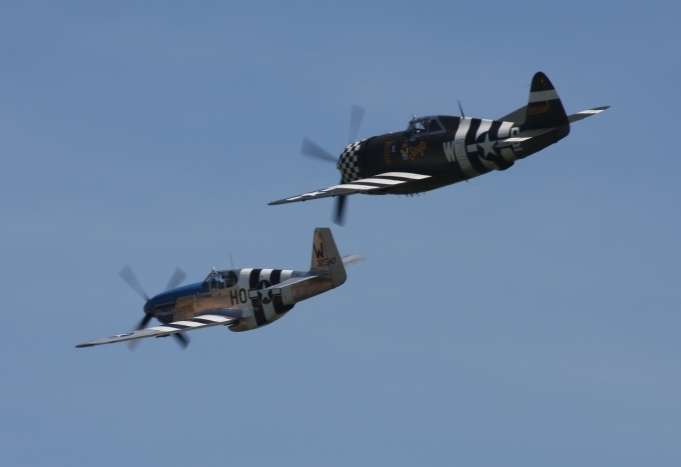 Duxford's first display of the season and with fantastic weather what more could you wish for. 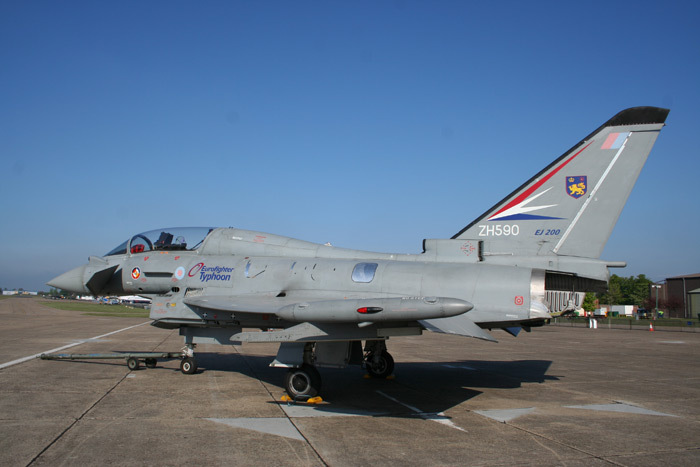 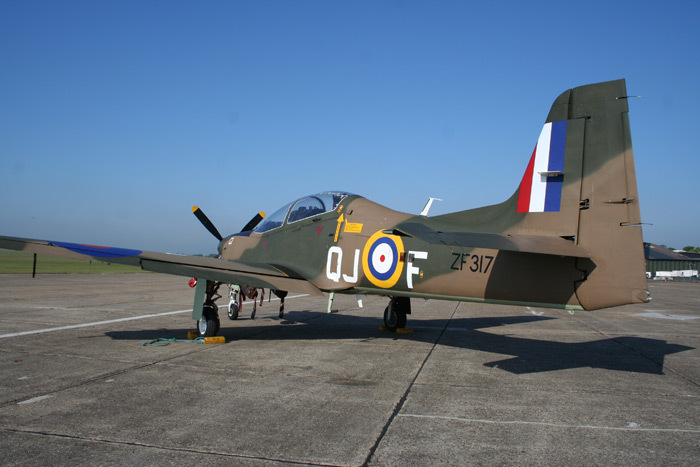 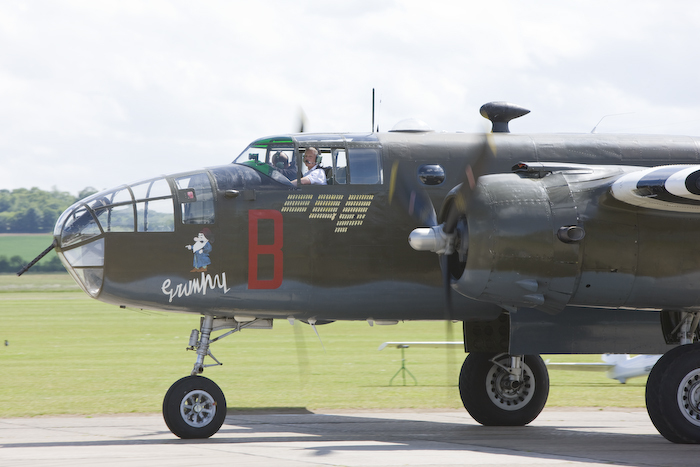 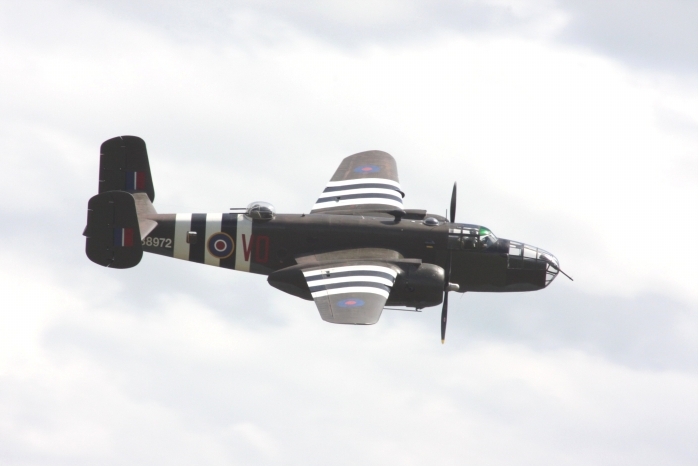 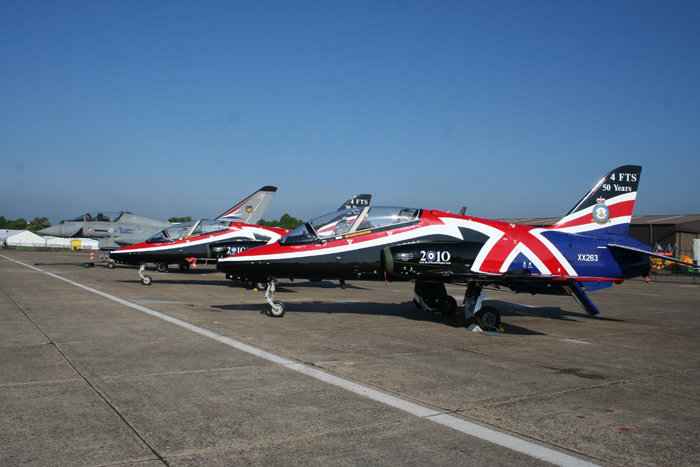 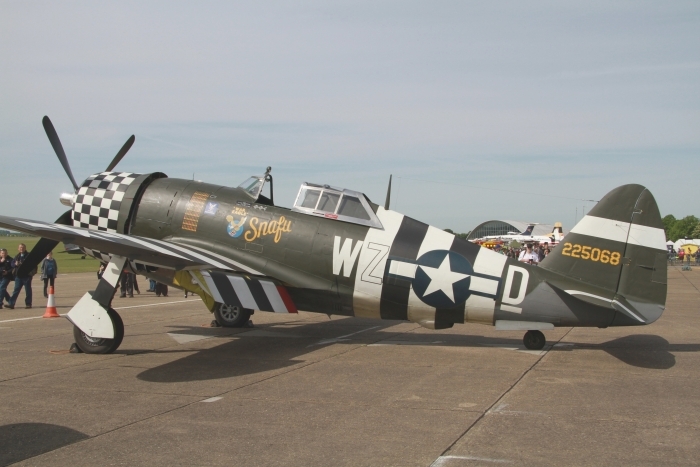 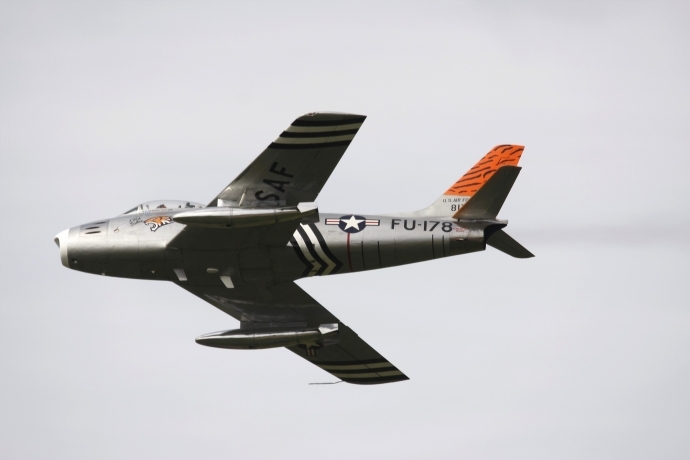 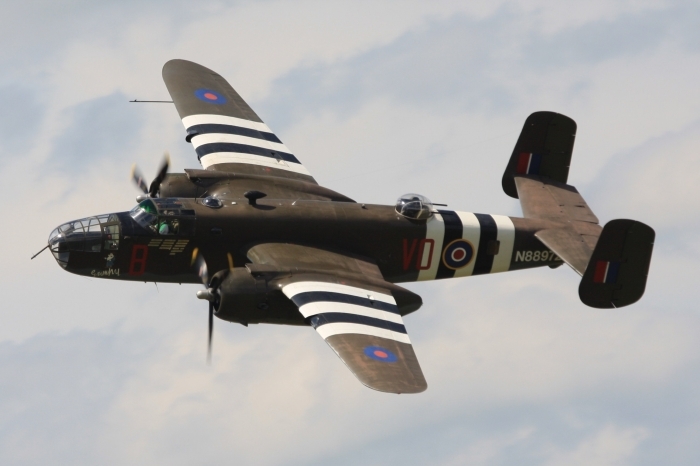 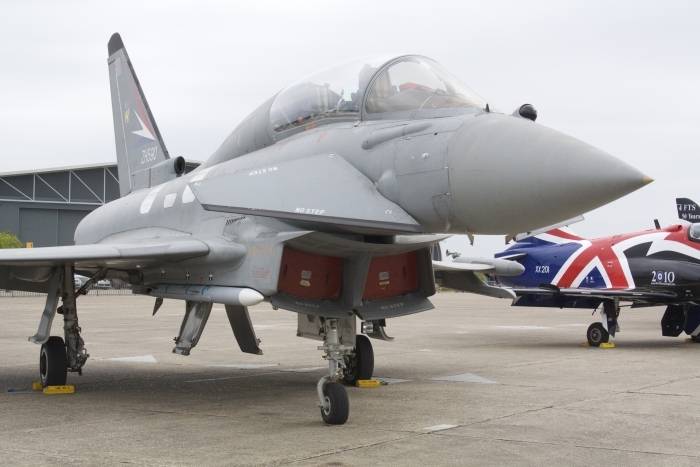 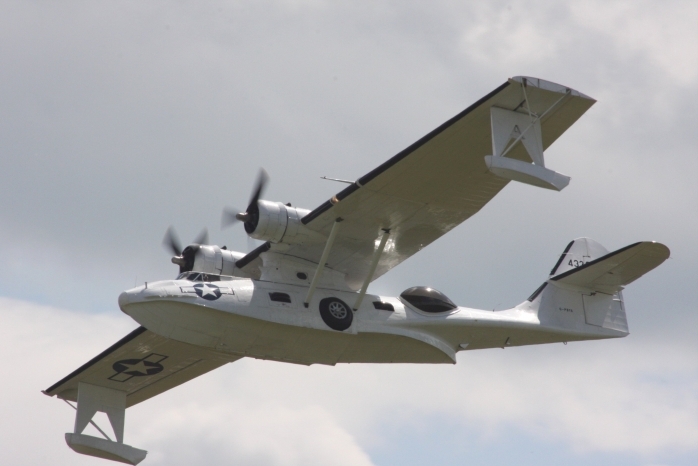 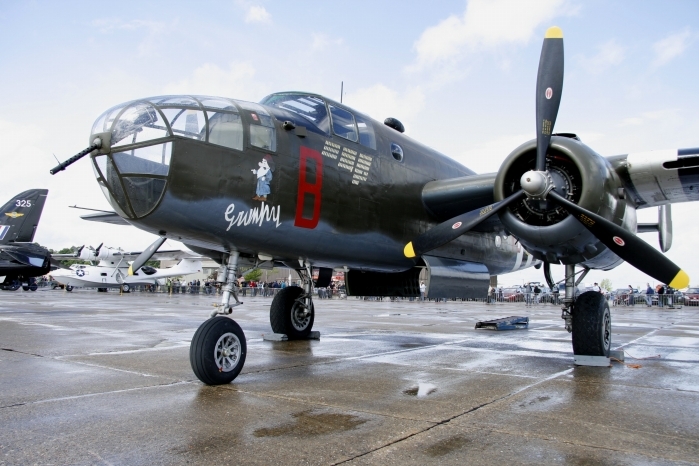 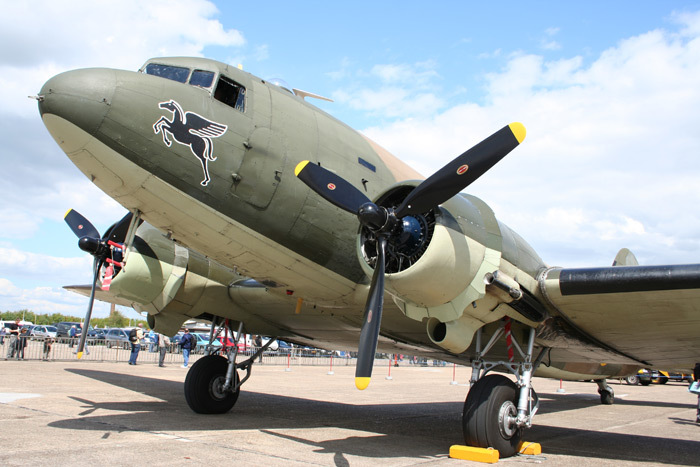 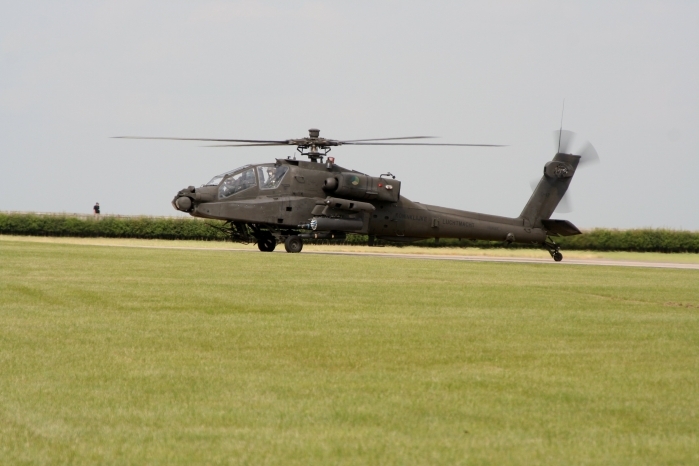 The theme of this year's Spring Air Show was the 70th anniversary of the arrival of the United States Air Force in Great Britain. 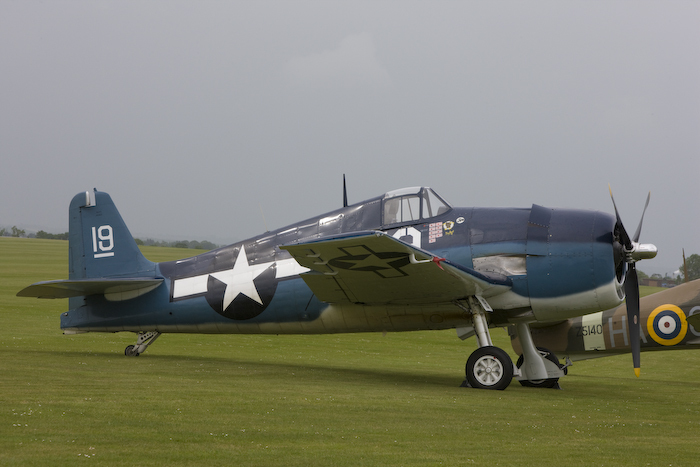 To this end the Eagle Squadron were in evidence at Duxford. 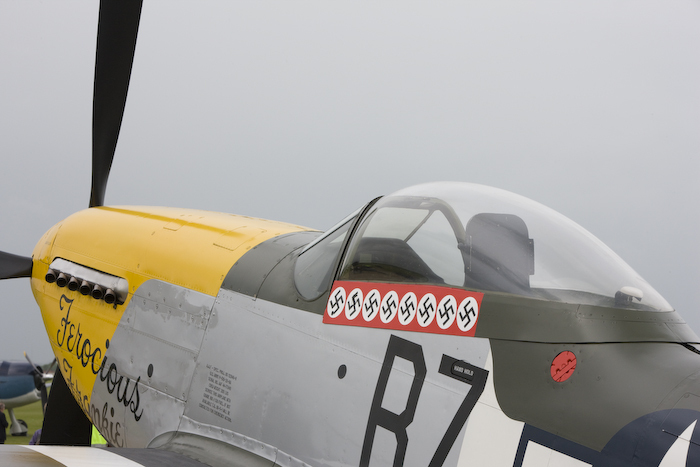 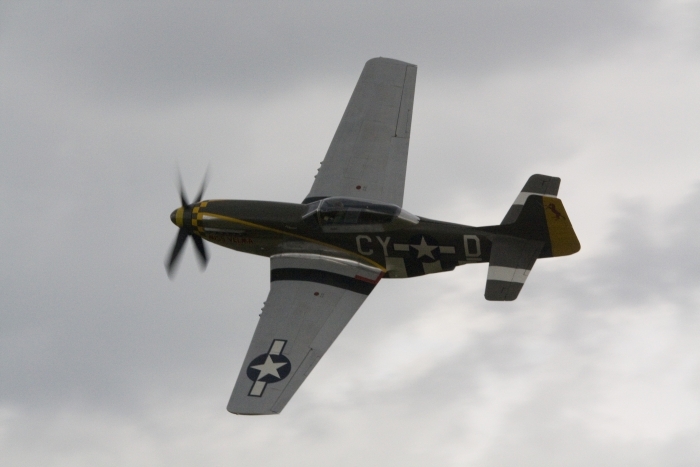 Opening the show was WWII veteran Bud Anderson flying in the Mustang Miss Velma with Dan Friedkin, Bud at 91 years old, an icon of the aviation world, flew the Mustang during the Second World War. 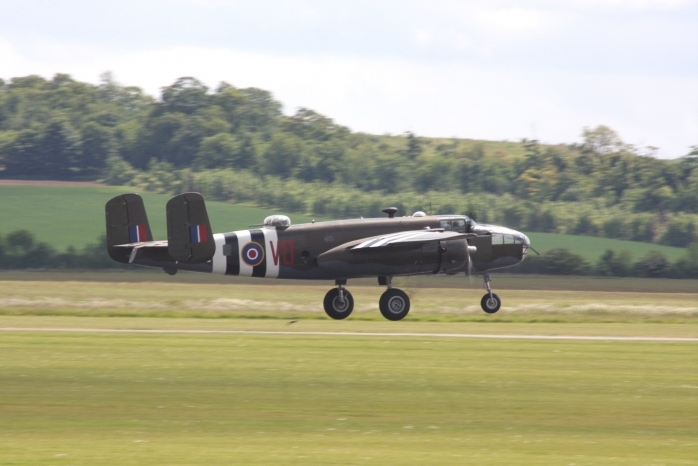 Shortly after this flight the Eagle Squadron were in action gracing Duxford's skies with the Mustang, Spitfire, Hurricane and Thunderbolt, the aircraft carried out a flypast with B-17 Sally B before performing four-ship passes and then breaking off into pairs for some loops and rolls. 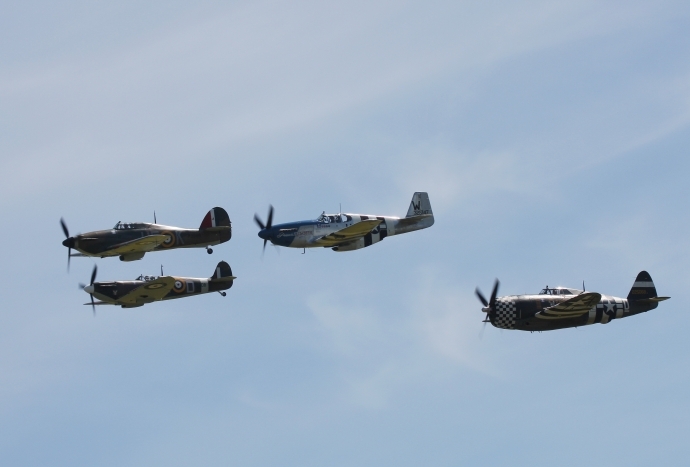 As usual Duxford's resident aircraft were out in force with displays by a pair of P-40s followed by a pair of Harvards and a Stearman. 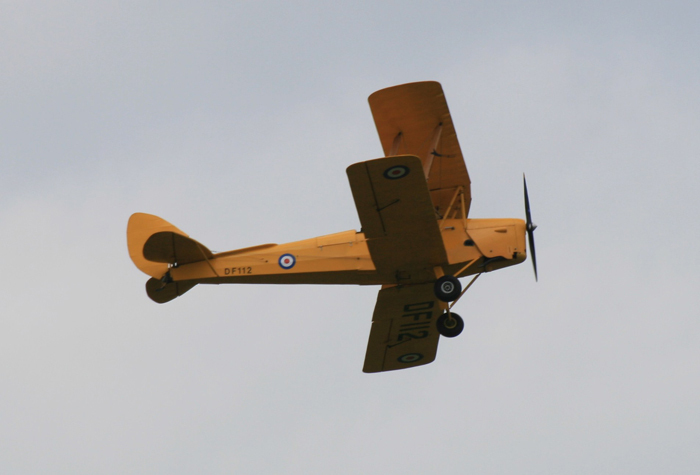 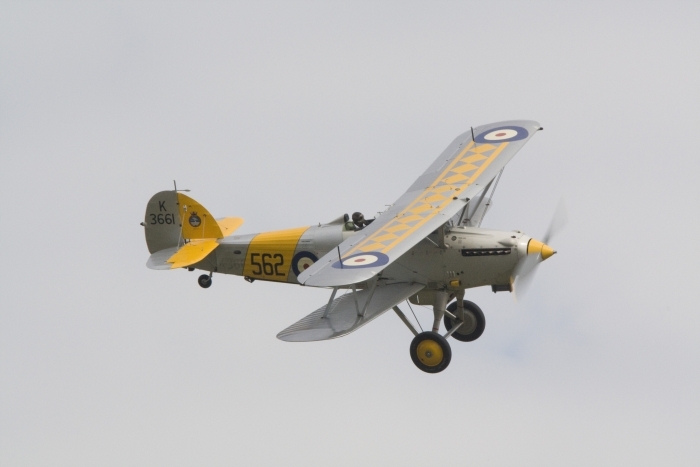 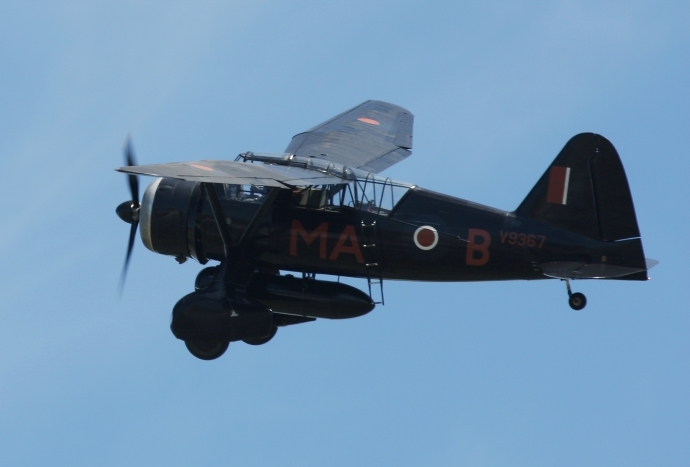 The Lysander over from Old Warden was a welcome visitor to Duxford with its demonstration of low speed handling. 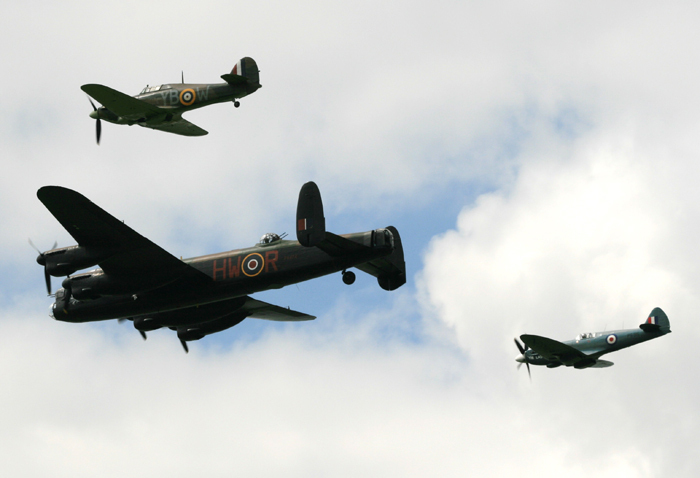 As usual the ever popular aircraft from the Battle of Britain Display made an appearance, the Lancaster, Spitfire and the newly painted Hurricane. 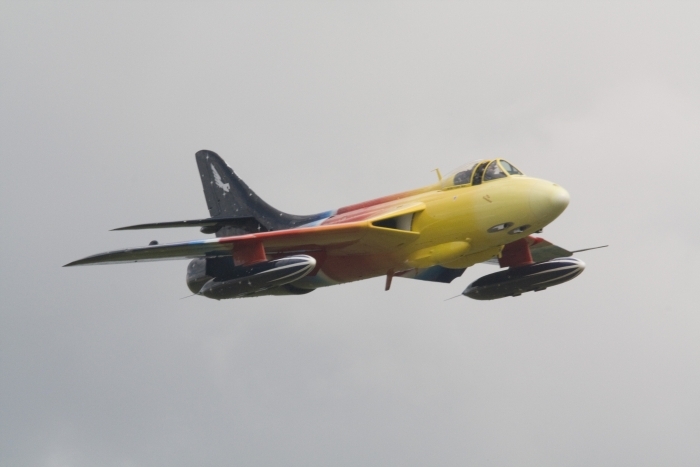 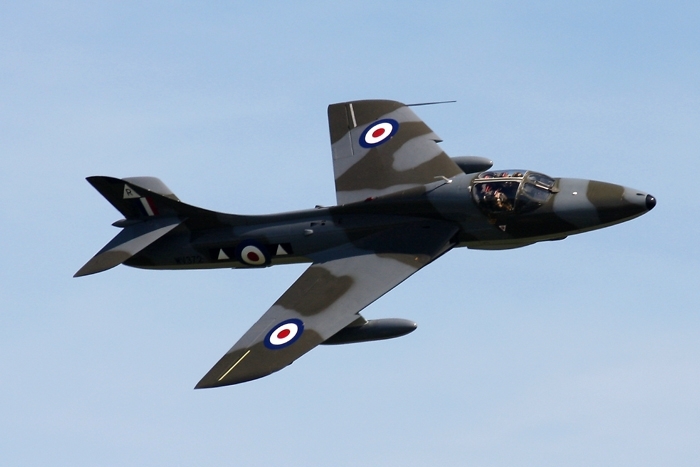 A welcome change was the Hunter T7 up from North Weald, one of only two vintage jets at the display. 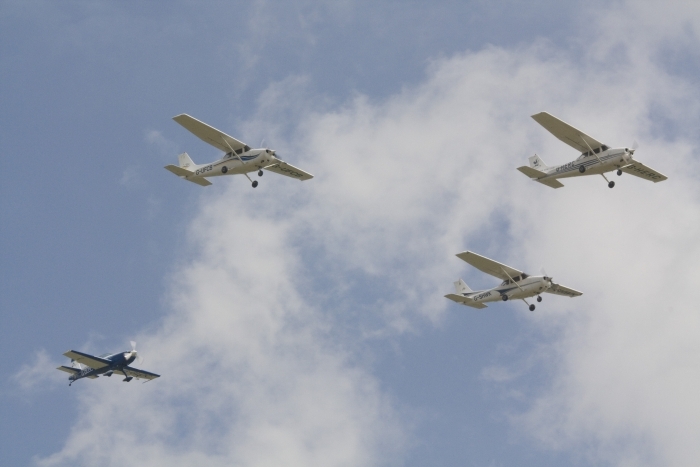 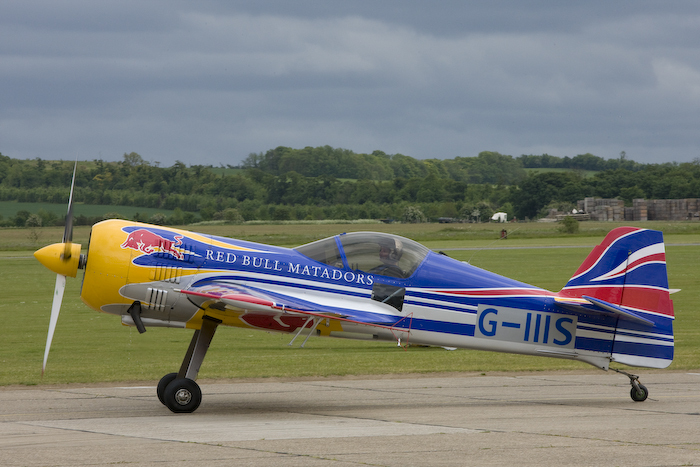 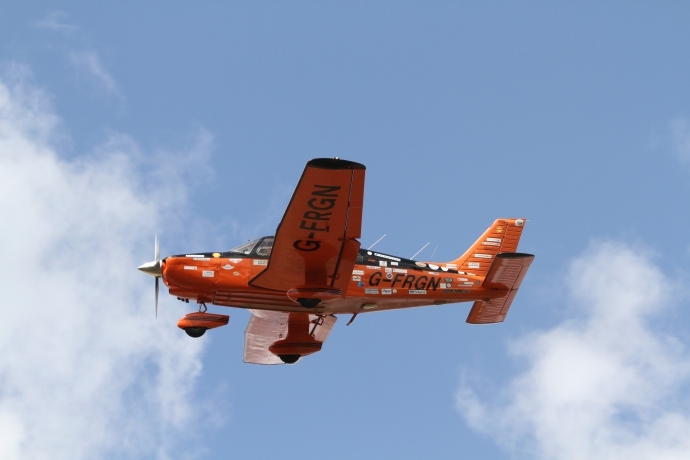 Also of note were the fast moving aerobatics by the Trig Team and the RV8tors. 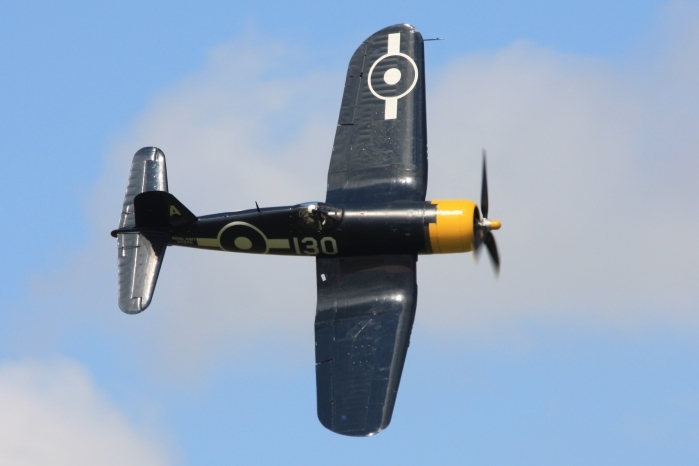 And old favourite and another resident at Duxford is Golden Apple's Sabre, back in the air after a long period of maintenance. 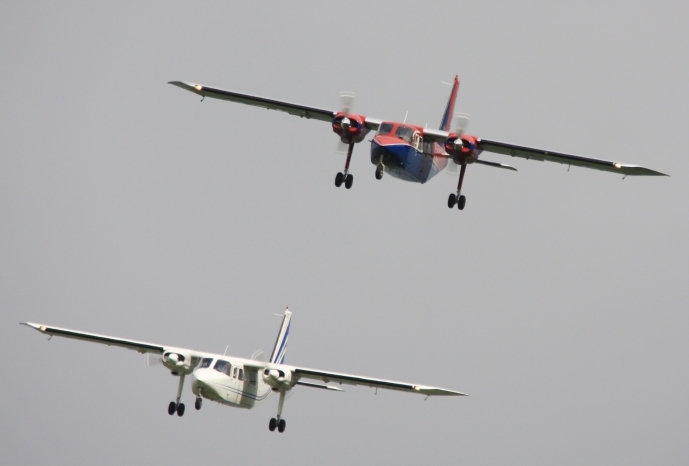 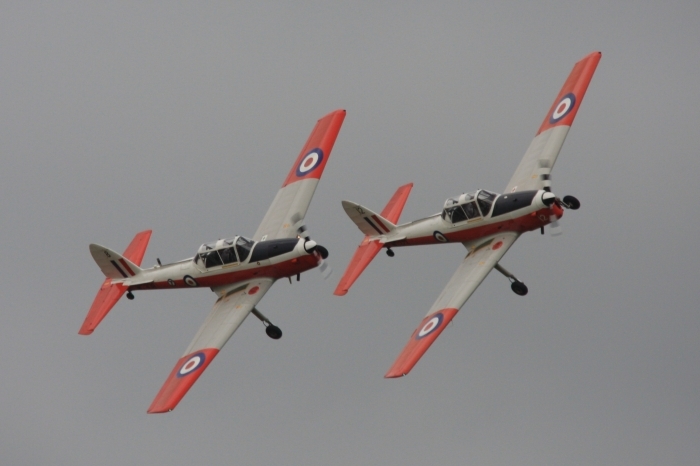 Slowing things down now, some of the most sedate aircraft on the day were the pair of L4 Cubs, once again demonstrating the low speed handling of these small aircraft. 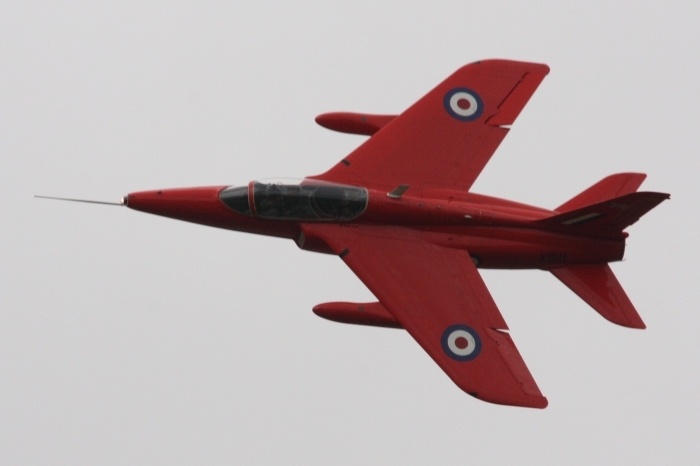 A fitting end to an excellent show was the flypast by the RAF Red Arrows in formation with the Eagle Squadron, followed by the classic nine-ship display by the Red Arrows closing the show. 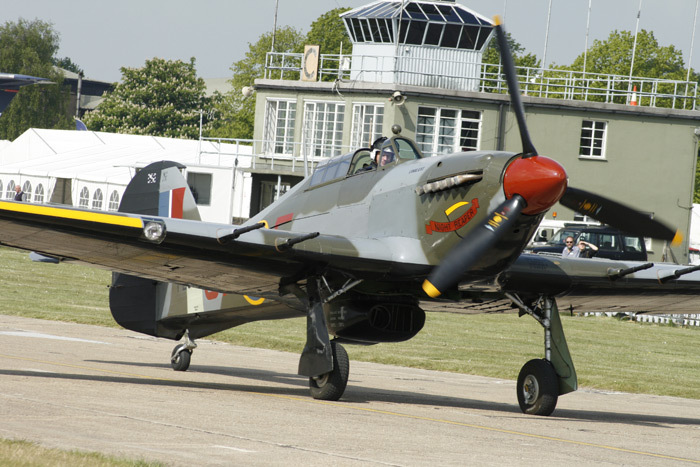 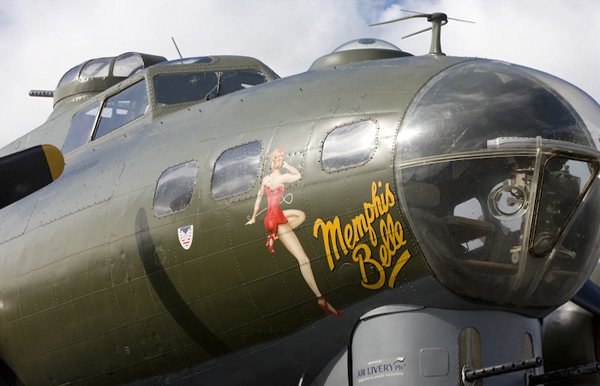 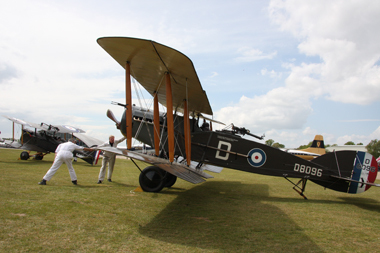 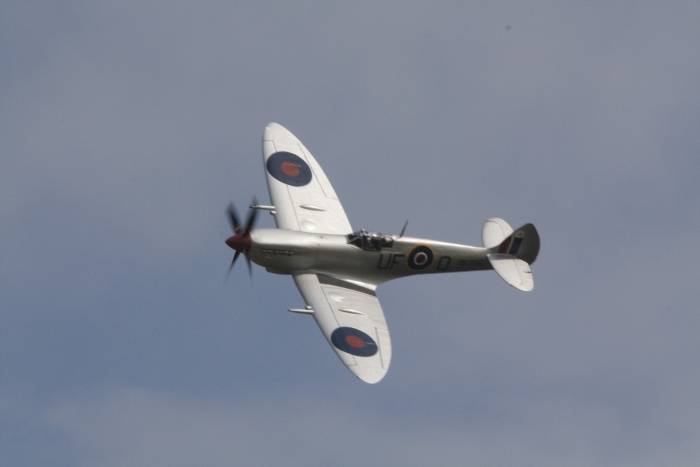 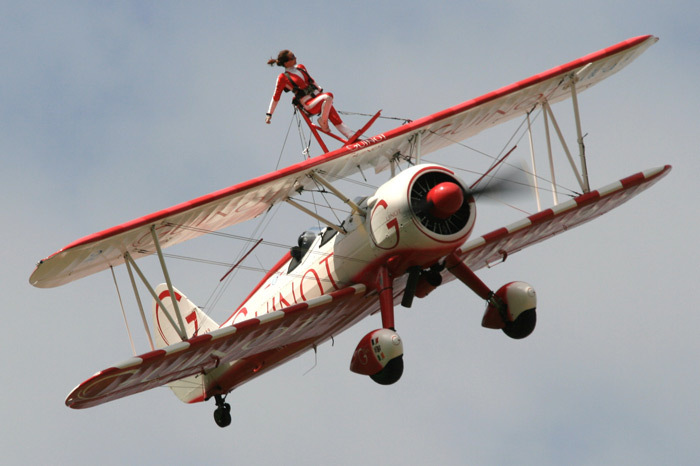 The first air show of the 2011 season was the Duxford Spring Air Show, celebrating women in aviation. 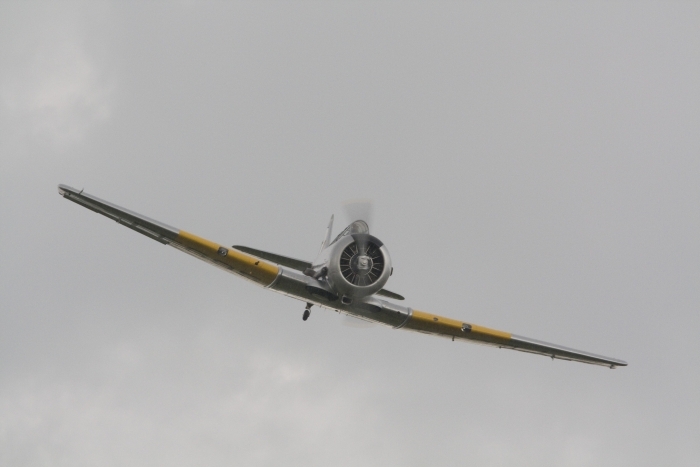 A broad spectrum of aircraft and pilots were covered, but unfortunately due to the ever increasing wind, some of the lighter aircraft were not able to take to the skies. 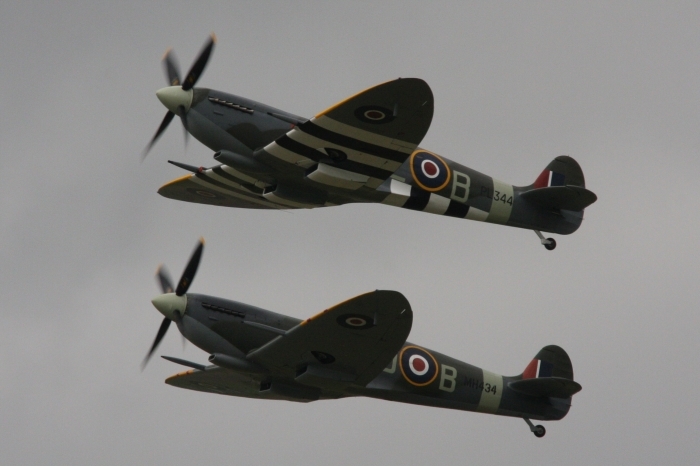 Carolyn Grace in Spitfire Mk IX ML407 and Anna Walker in Kennet’s Seafire Mk XVII SX336 carried out a flypast with both aircraft before doing their own displays. 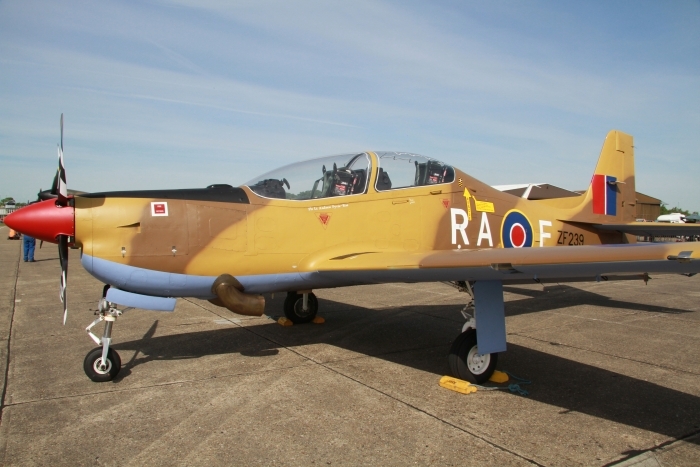 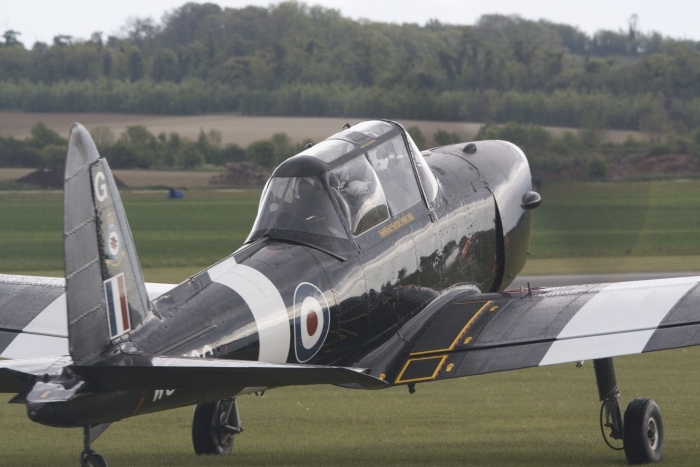 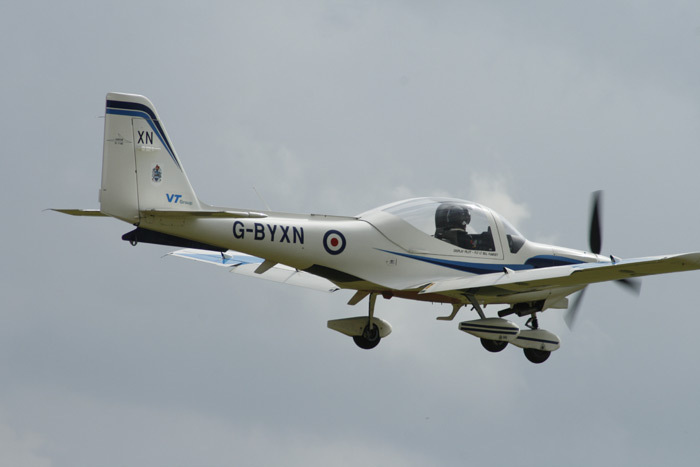 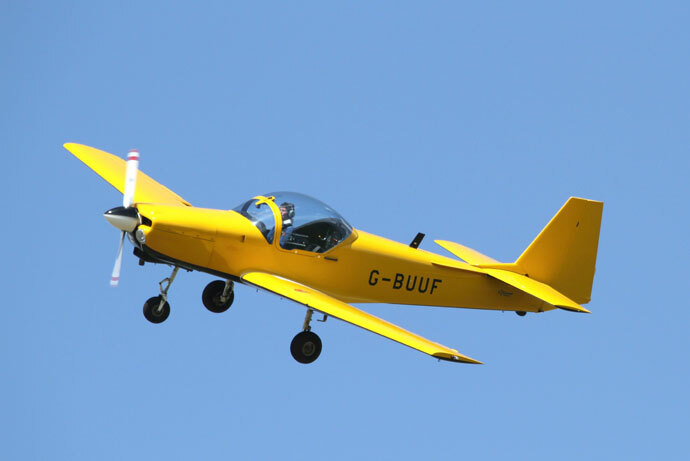 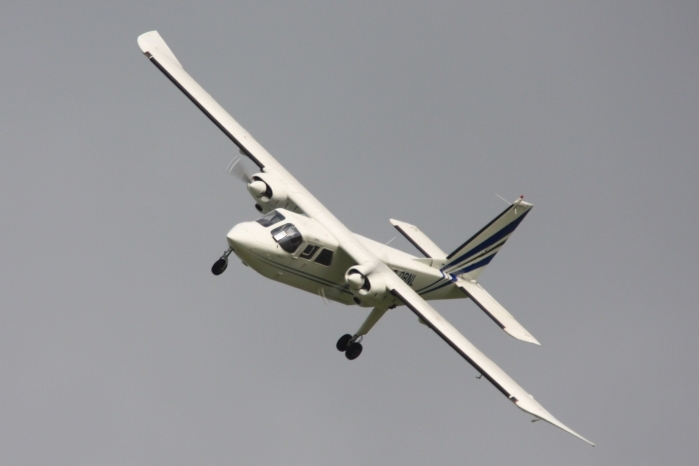 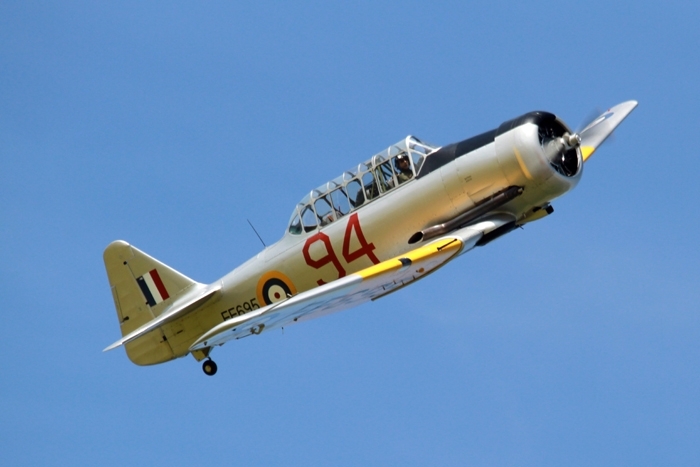 Some of the smaller aircraft were also flown by lady pilots, including Polly Vacher in her Piper Dakota, Diana Britten in the CAP-232 and Tizi Hodson in the Slingsby T-67 firefly. 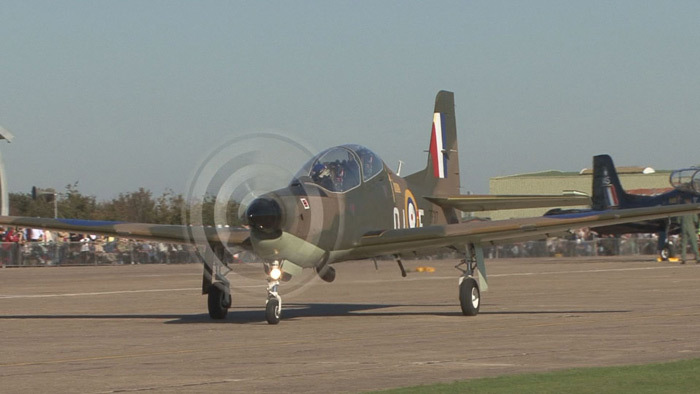 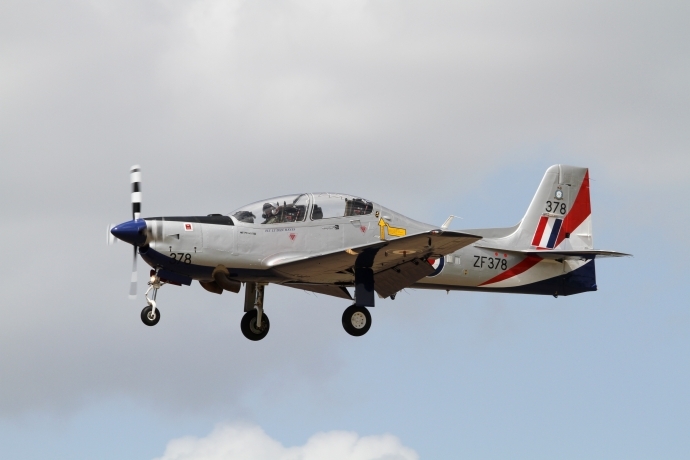 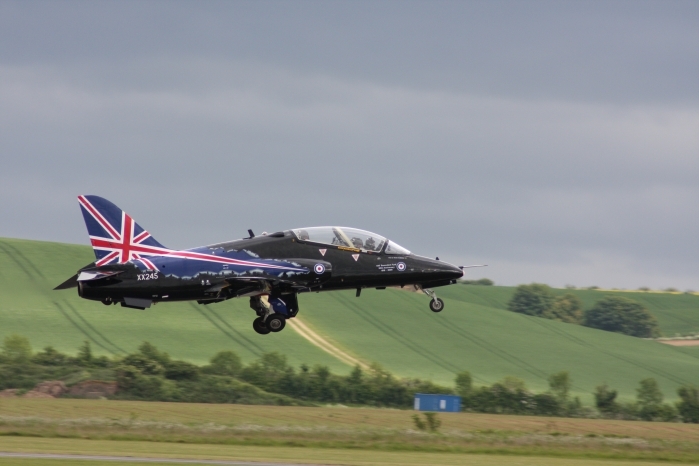 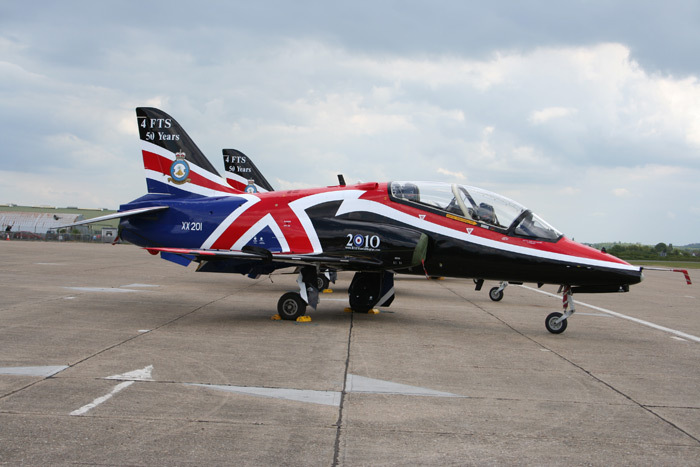 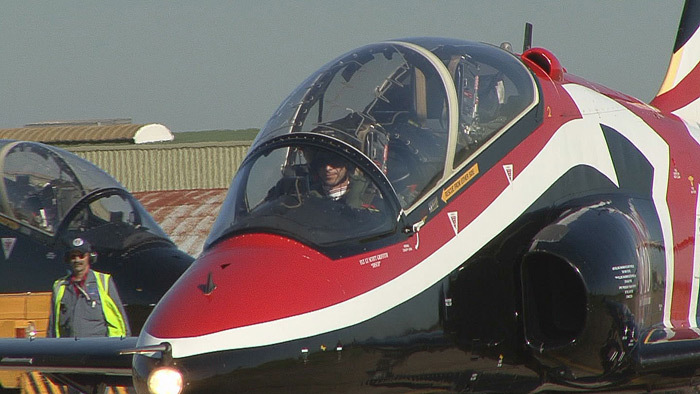 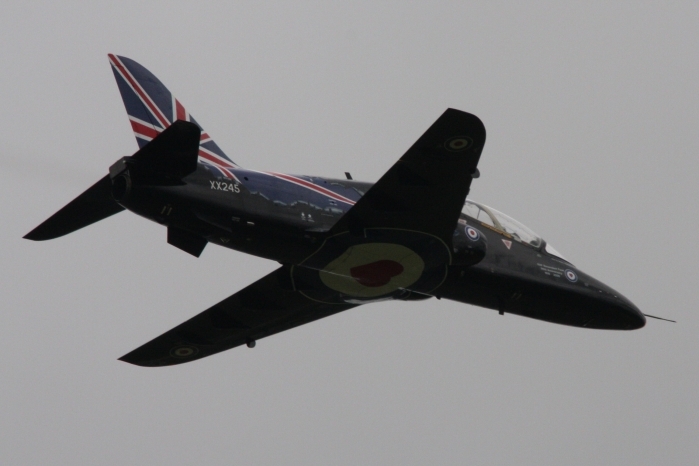 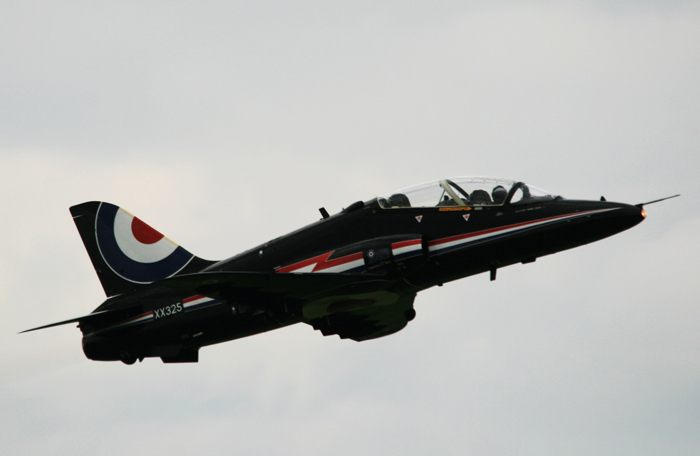 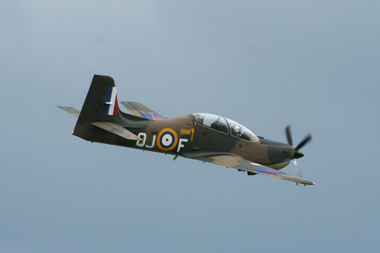 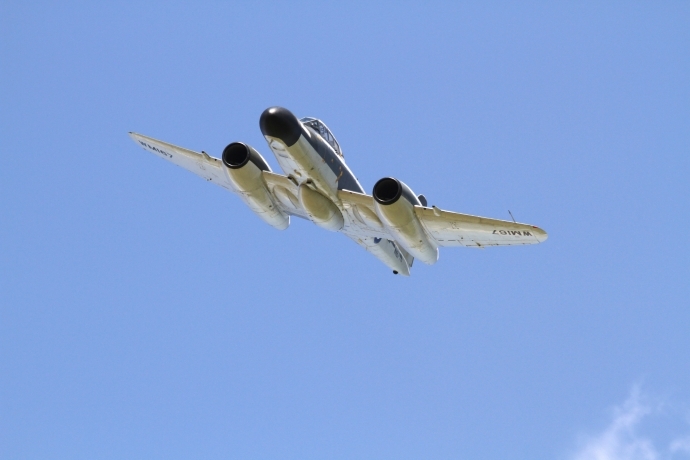 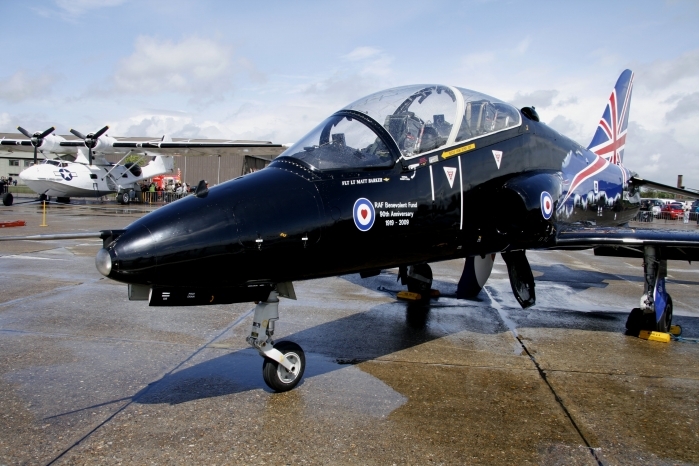 At the other end of the spectrum was the fast moving display by Flt Lt Juliette (Jules) Fleming in the RAF T1 Hawk. 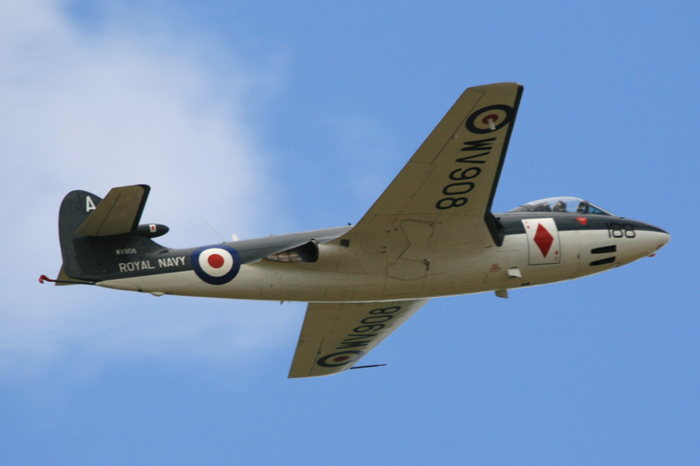 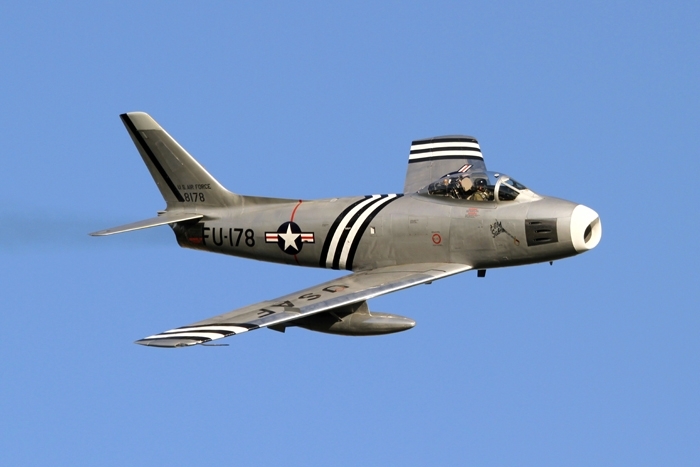 Some of the faster aircraft included Dan Griffith flying the Gloster Meteor NF.11 and Cliff Spink in the F-86A Sabre. 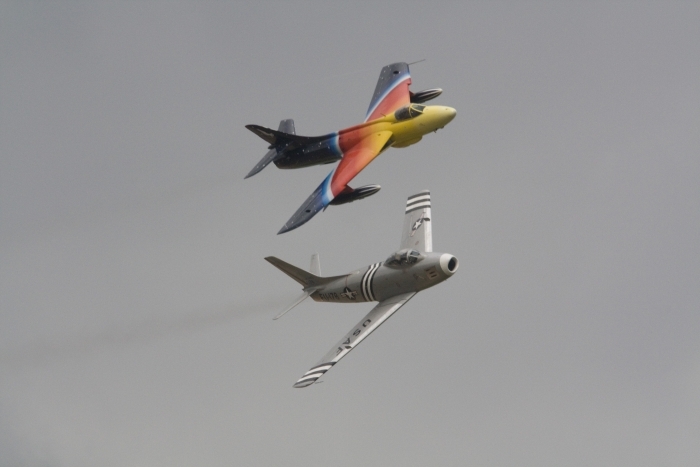 Two superb displays from two classic 1950s jets. 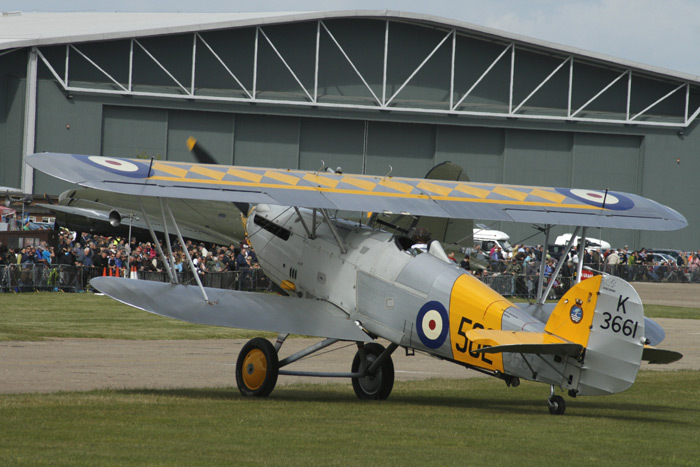 Other displays including The Breitling Wingwalkers, Catalina and Tucano, as well as Duxford based fighters such as the Spitfire, Mustang and Buchon. 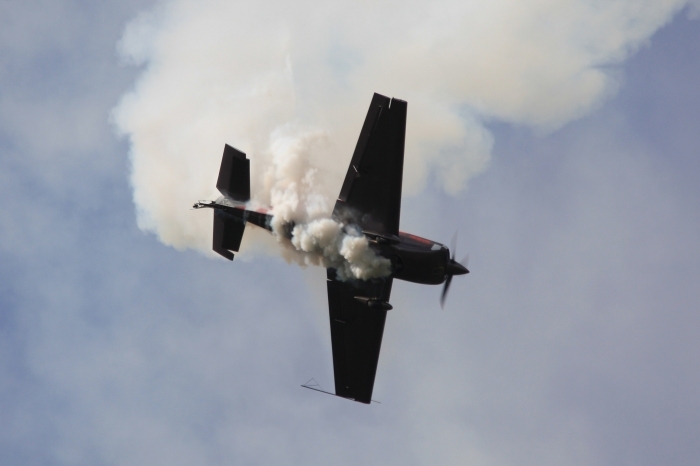 A mix and match air show which gave good value for money, with the added polished voice of Ben Dunnell, giving just enough information to keep everybody interested. 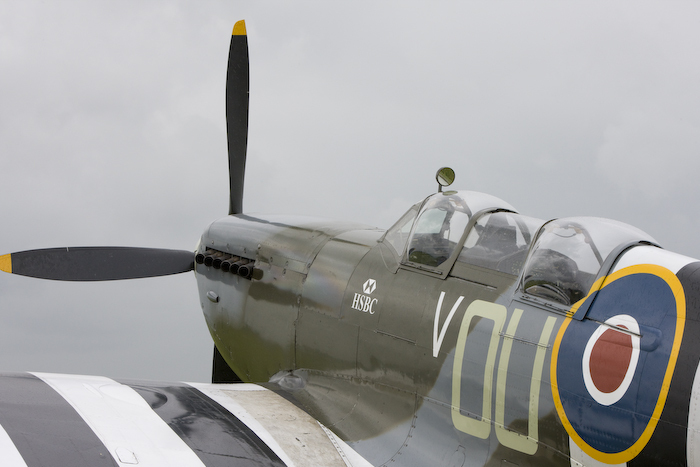 Following the successful Battle of Britain Memorial event the previous day, the weather conditions were cloudy and overcast but the rain held off almost until the end of the afternoon. 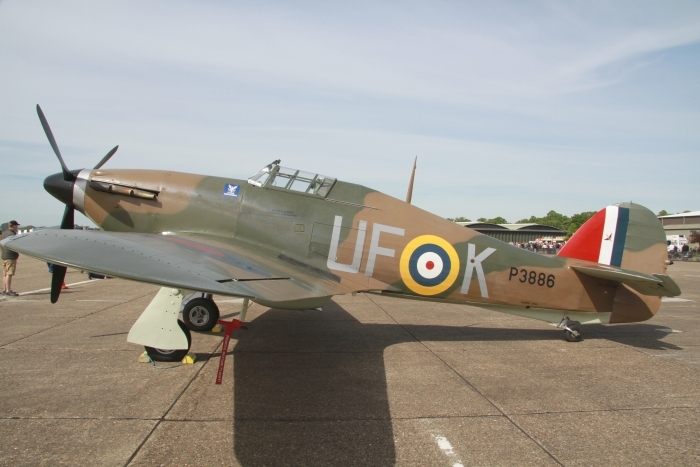 The Battle of Britain Flight were much in evidence, with a lot of their personnel on hand to meet the public and also a pair of Spitfires, a pair of Hurricanes, a Chipmunk and a Dakota. 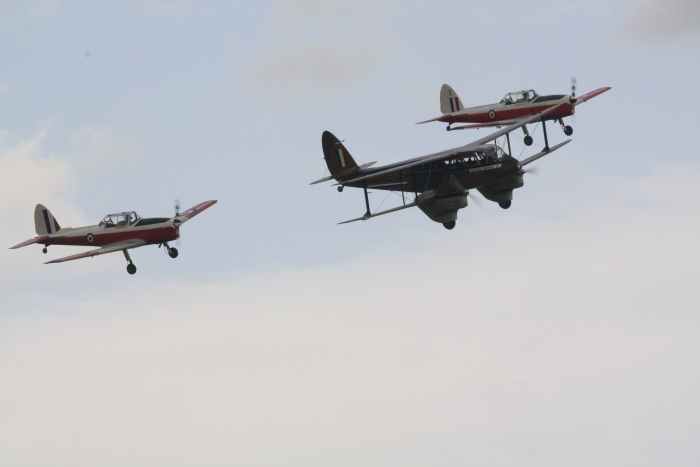 Aircraft participating in the flying display were a Hurricane and Spitfire pair, a three-ship formation of Hurricanes, B-17 Sally B, Sea Fury, Harvard, Mustang, Chipmunk pair and a Dragon Rapide, Hawker Nimrod, The Black Cats and formation flypasts by the Golden Apple F-86 Sabre and Hawker Hunter Miss Demeanour. 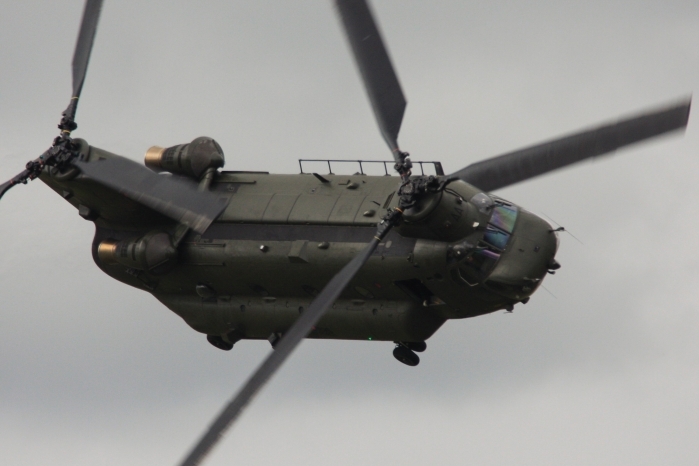 Over all the air show was well supported and for the first major air show of the season, a good effort by the organisers. 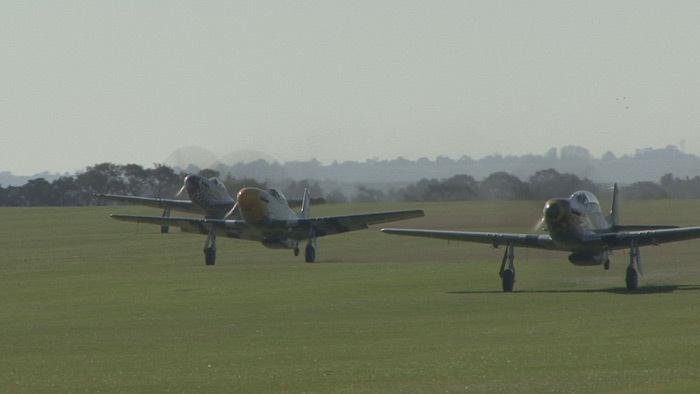 A normal opening day for Duxford Airfield, with an added bonus for the visitors. 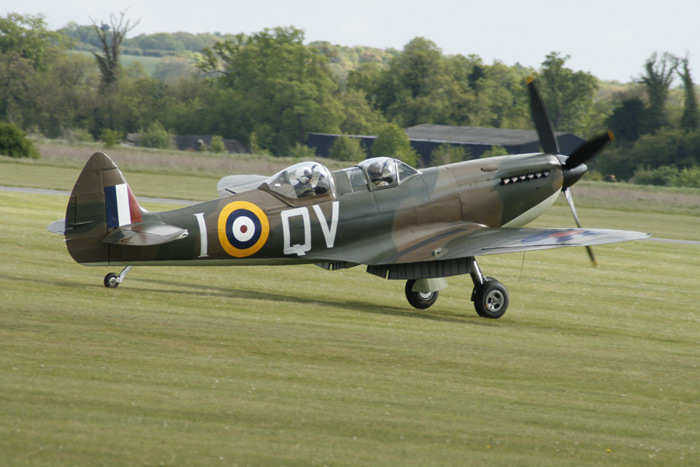 This World War II fighter base once again reverberated to the sound of Merlin engines, as four Hurricanes closely followed by two Spitfires overflew the airfield before landing. 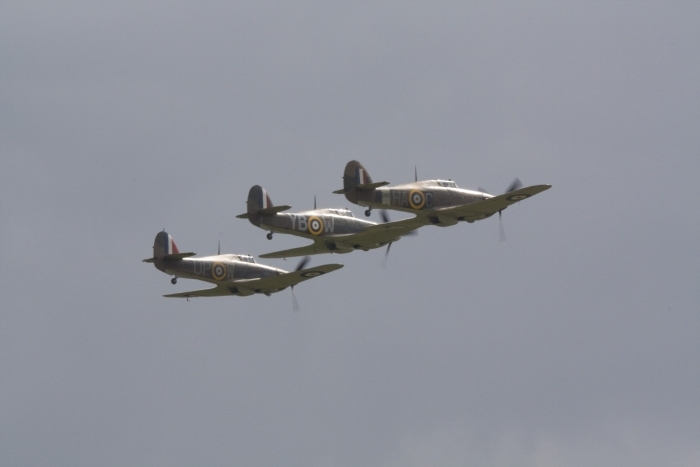 This is probably the first time for many years four Hurricanes have actually been in a formation overhead Duxford. 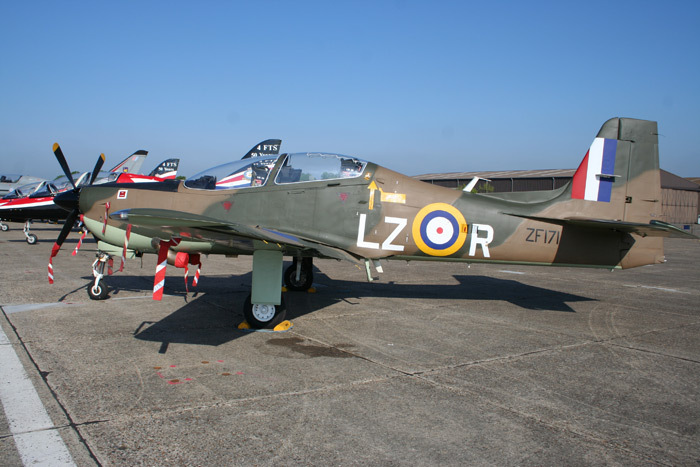 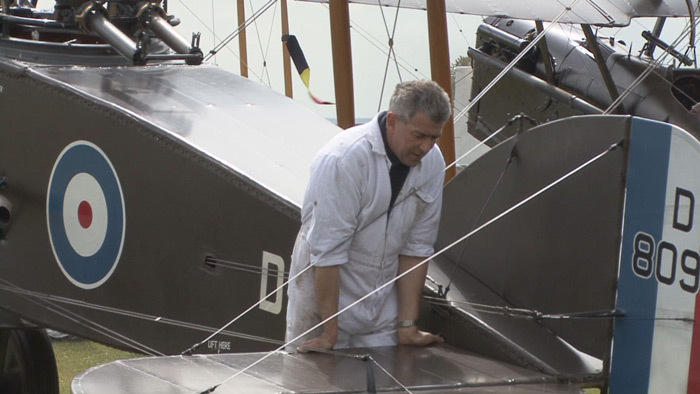 The aircraft taking part were HAC's Z5140, Peter Vacher's R4118 and The Battle of Britain Memorial Flight's LF363 and PZ863. 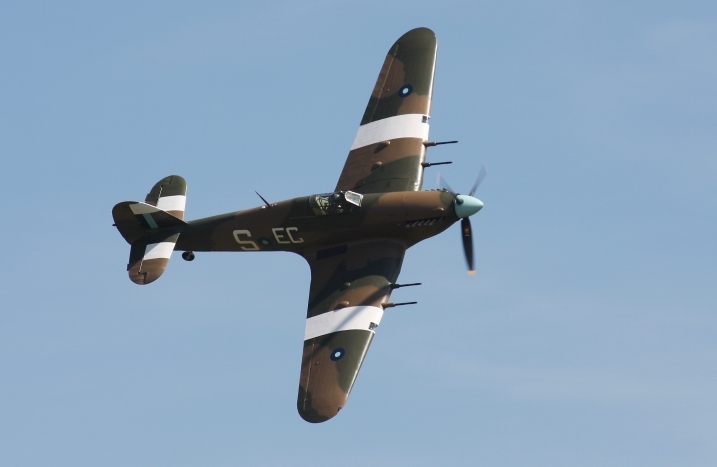 Also from The Battle of Britain Flight was one of their uniquely painted Chipmunks and also the Dakota arrived later in the day. 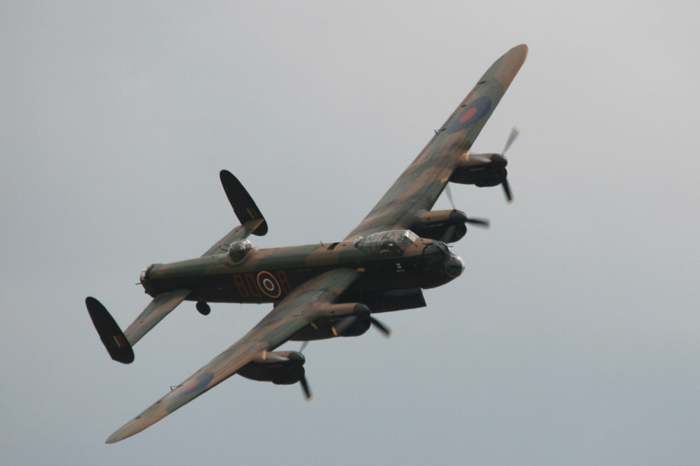 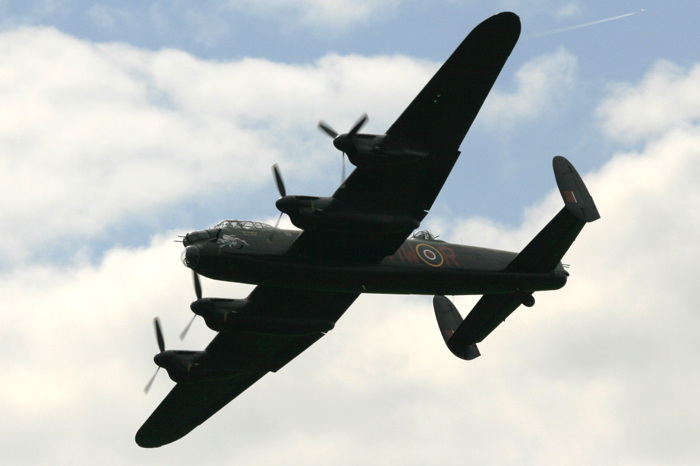 Unfortunately due to a strong crosswind the Lancaster was unable to land, but gave the public several spirited flypasts before returning to Coningsby. 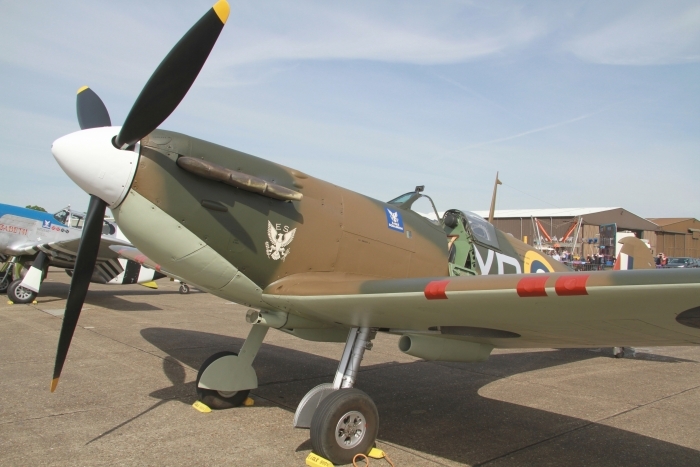 During the day, members of The Battle of Britain Memorial Flight were on hand to talk to visitors at Duxford and also World War II veterans were joining in the activities. 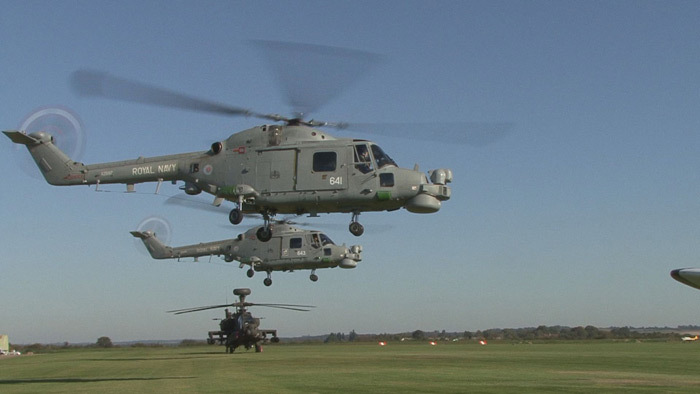 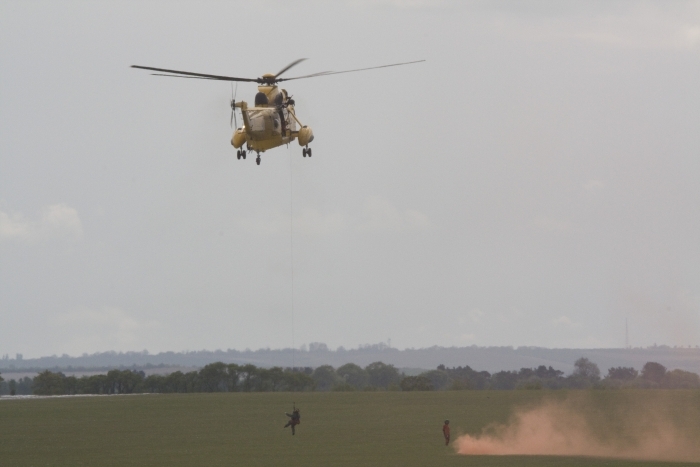 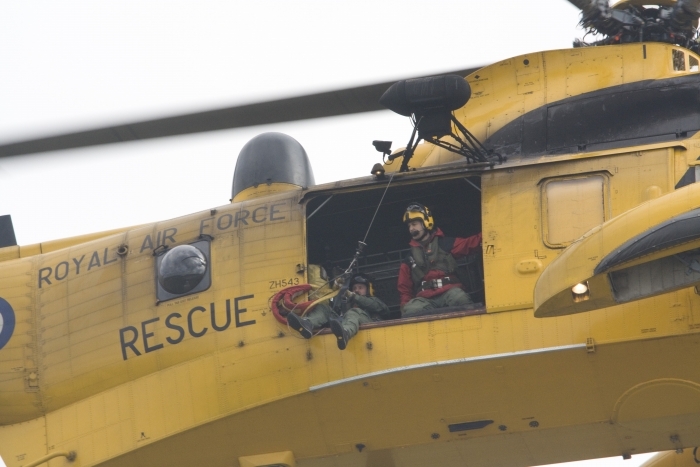 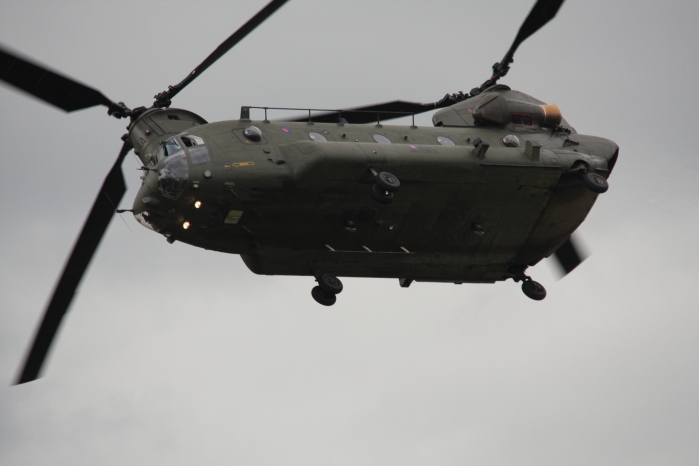 Other events included a demonstration with RAF equipment, Air Cadets marching and the RAF band playing. 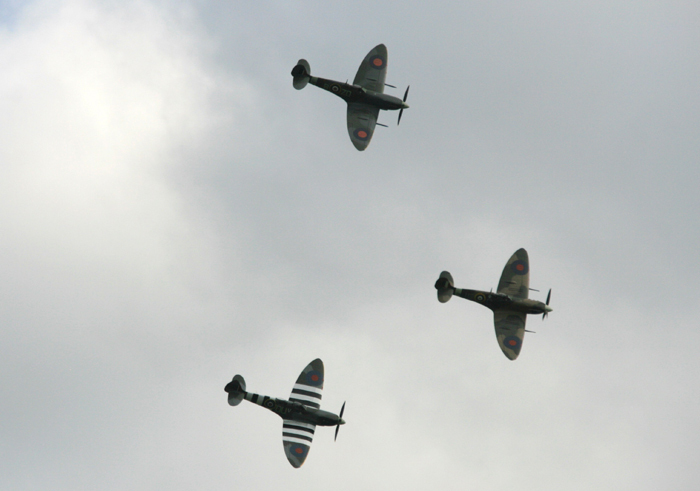 The finale of the afternoon was a flypast by The Battle of Britain Flight's Spitfire and Hurricane, as the standard was being lowered on the parade ground. 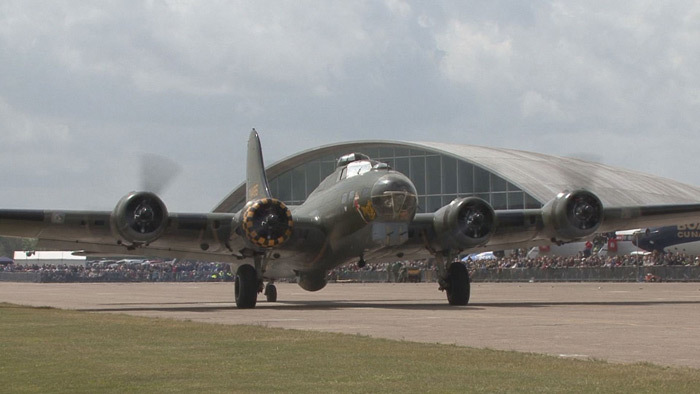 Duxford's first air show of the season got off to a windy, wet and overcast start. 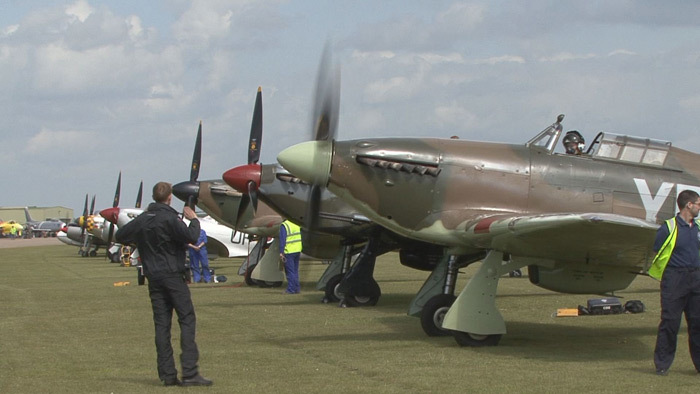 Looking at the weather conditions it seemed unlikely that there was going to be much flying. 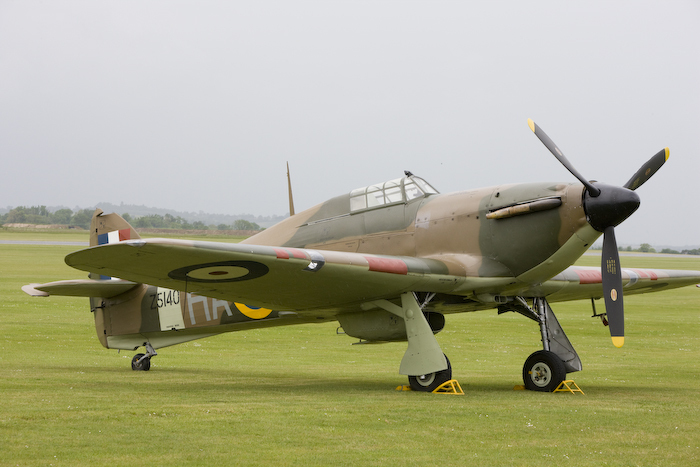 With most of the public taking a look around the hangars to escape the wind and wet, the normally busy exhibitions and displays outside were unnaturally quiet. 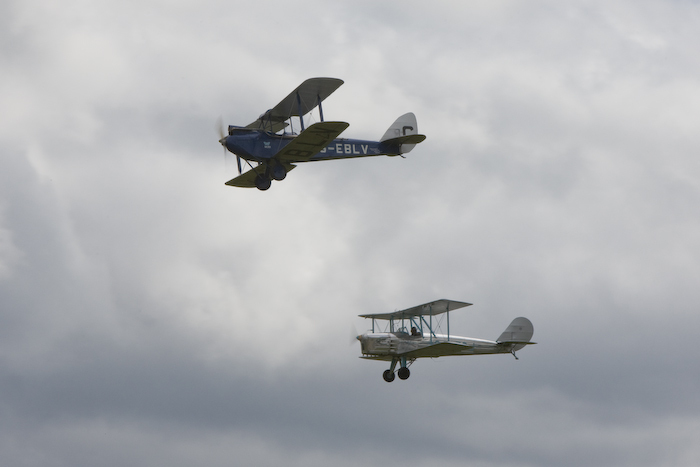 By the middle of the day things started to improve, but sadly The Battle of Britain Memorial Flight and The Tiger Moth Display Team cancelled due to weather conditions. 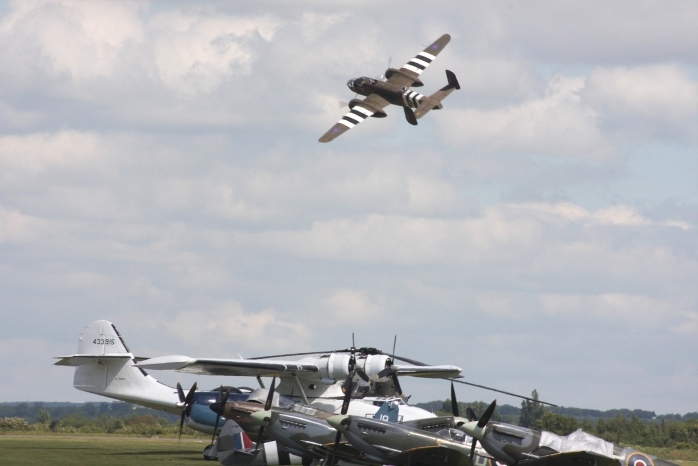 The best of British air show with some of the aircraft taking part described below, included modern aircraft such as the Typhoon and Hawk, through to the ever popular display by the Chinook adding a contrast to the slower moving piston aircraft of Duxford. 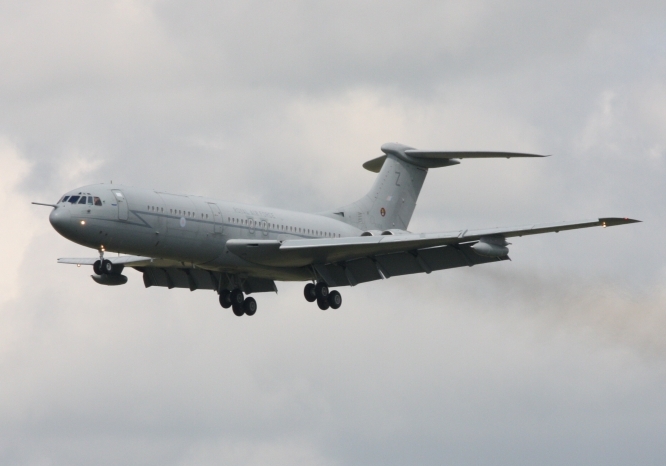 A very special visitor to Duxford from RAF Brize Norton was a 101 Squadron VC10 tanker aircraft. 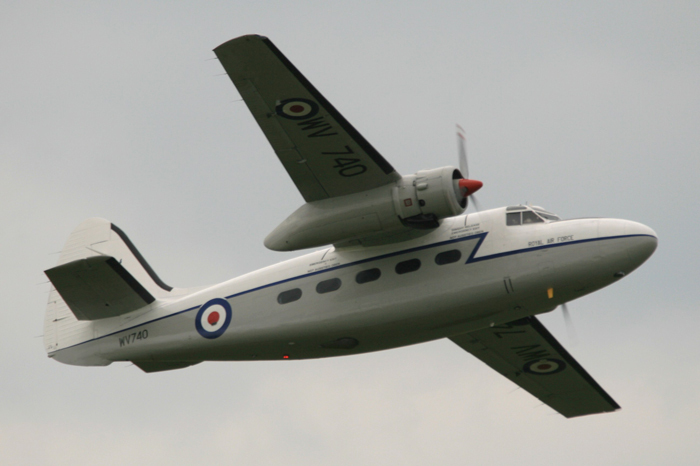 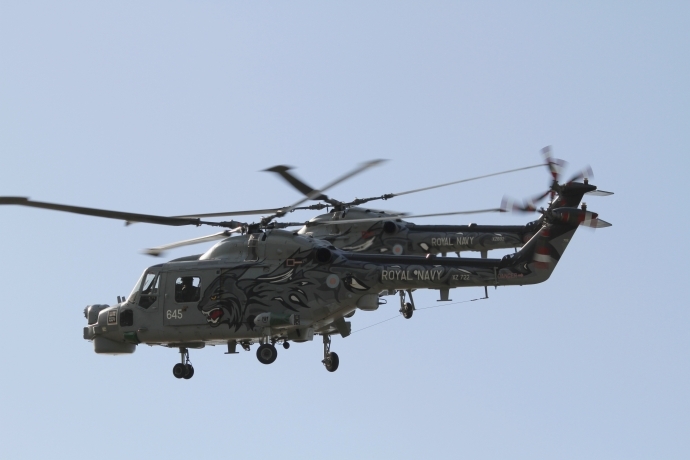 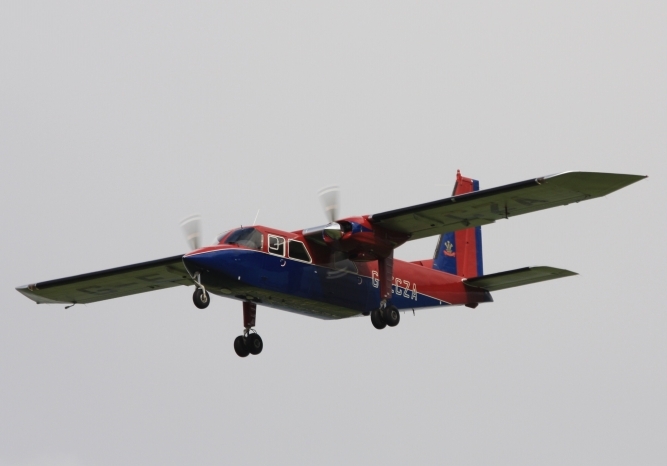 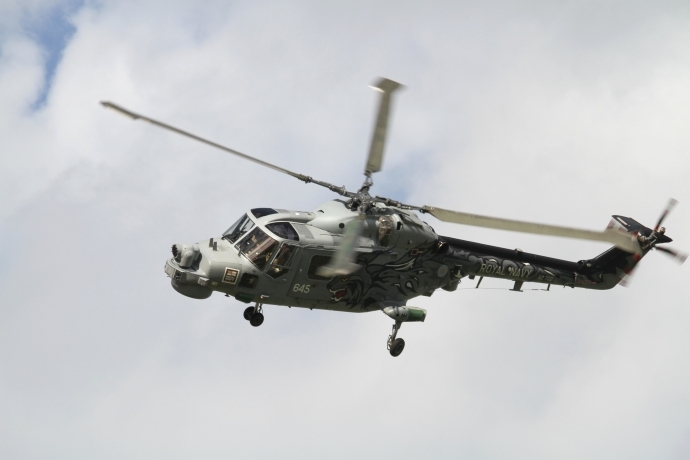 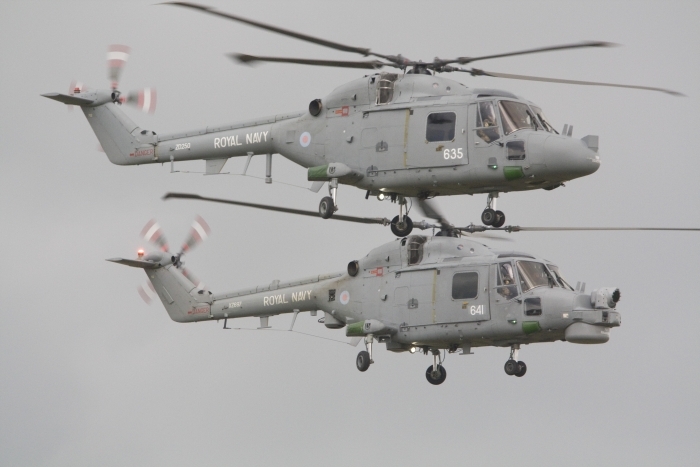 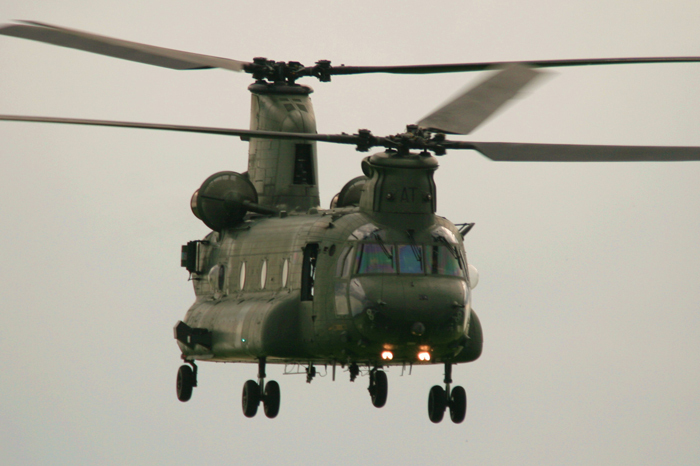 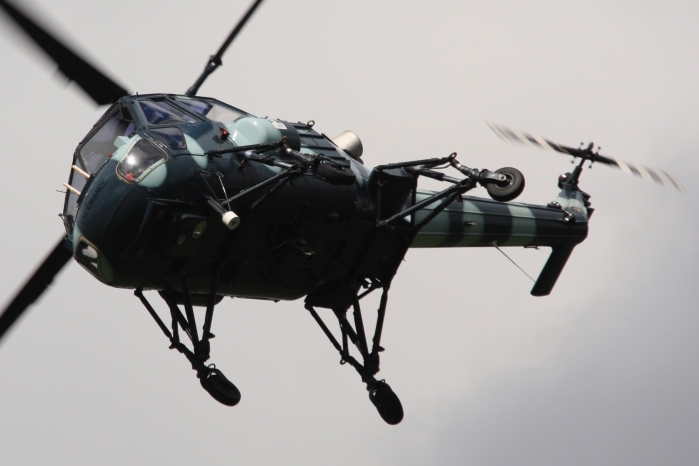 This particular aircraft XV109 has been in service with the RAF for over forty years and the type is due to go out of service in the next few years. 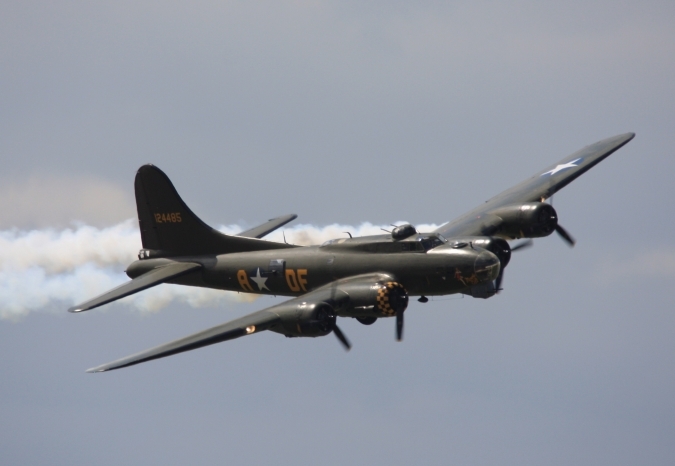 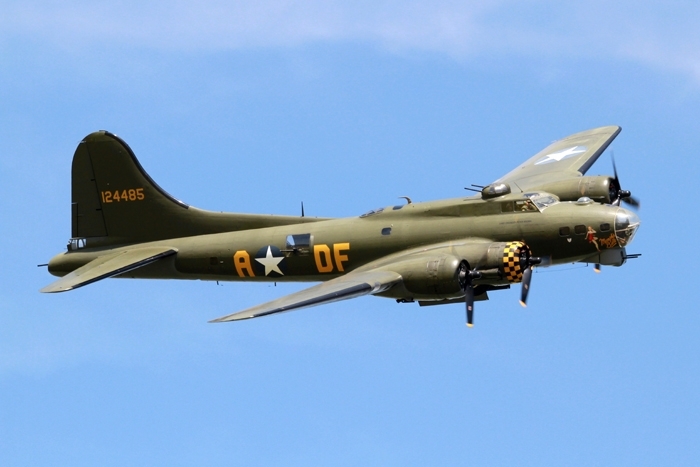 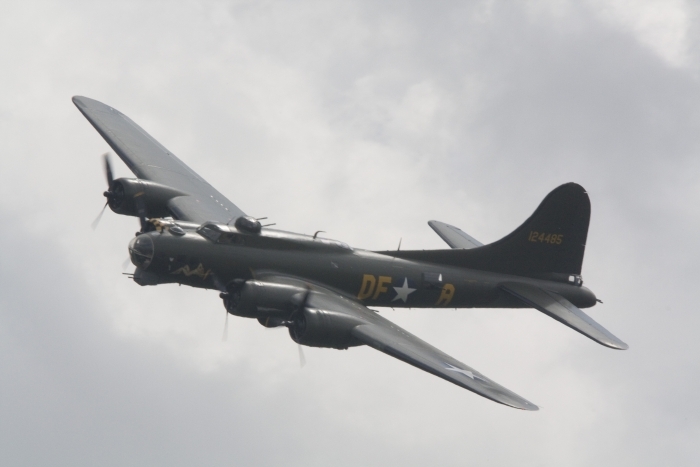 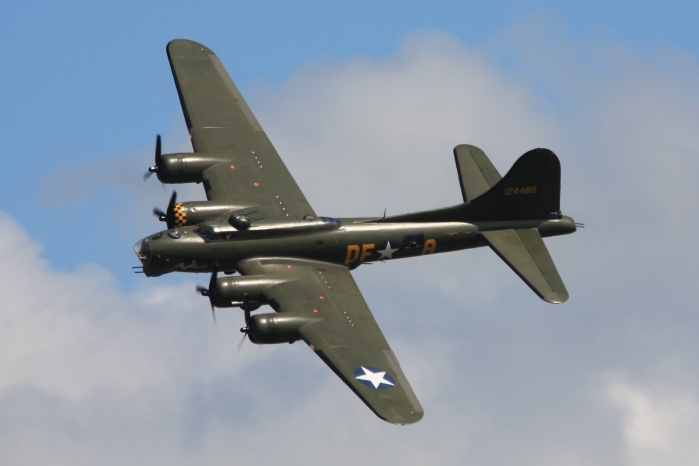 Another favourite with the crowds is the B-17 Sally B, displaying here for the first time for over a year. 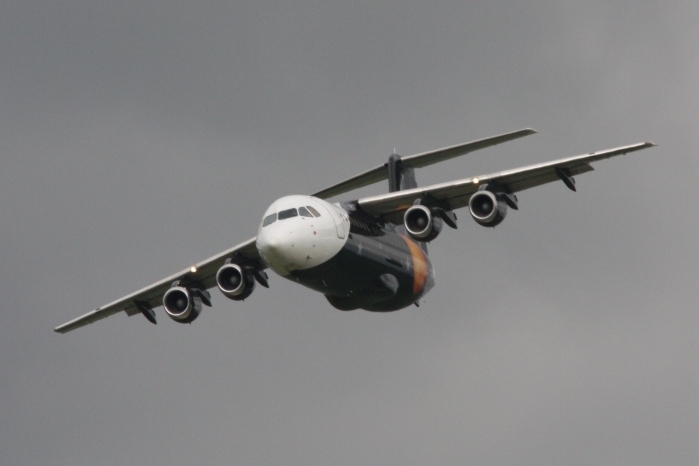 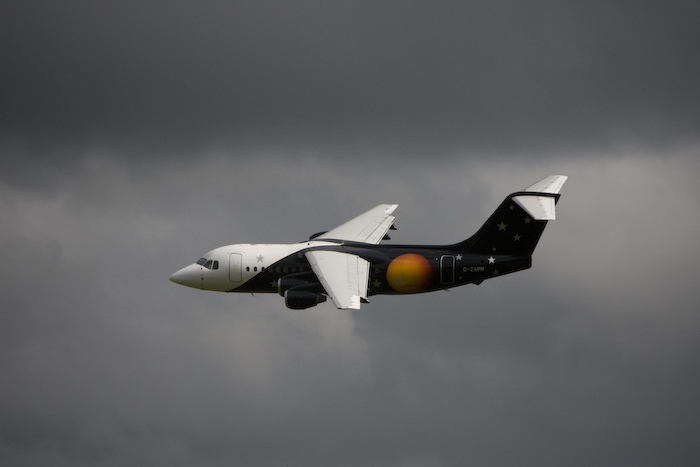 Among the more modern, larger aircraft was the BAe 146 sporting a smart colour scheme from Titan Airways. 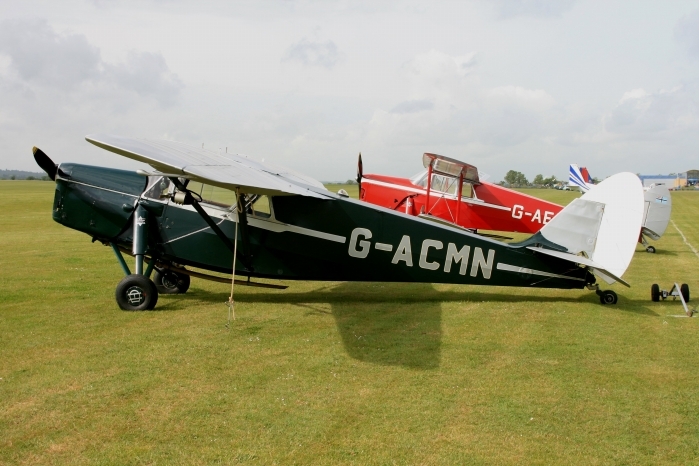 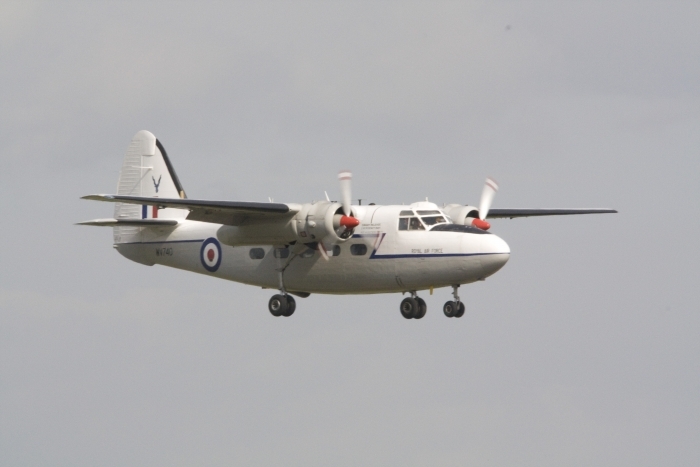 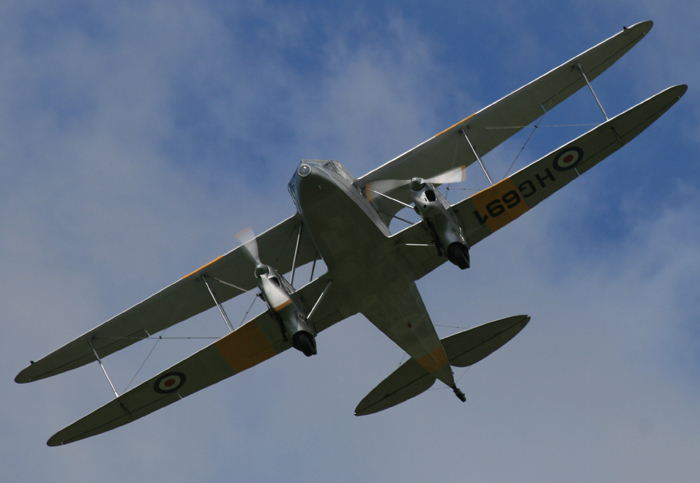 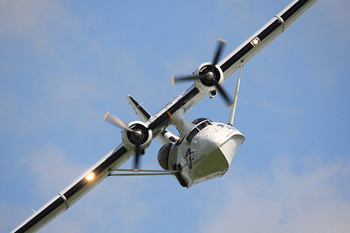 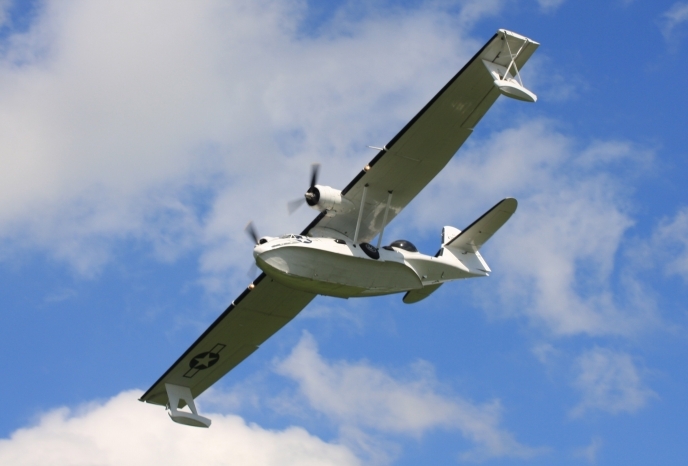 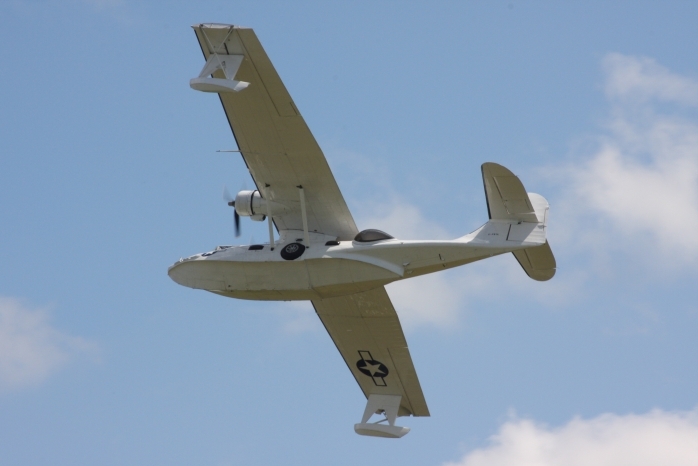 Other larger aircraft were the Britten-Norman Islanders, Plain Sailing's Catalina and the Mitchell B-25 flown by John Romain. 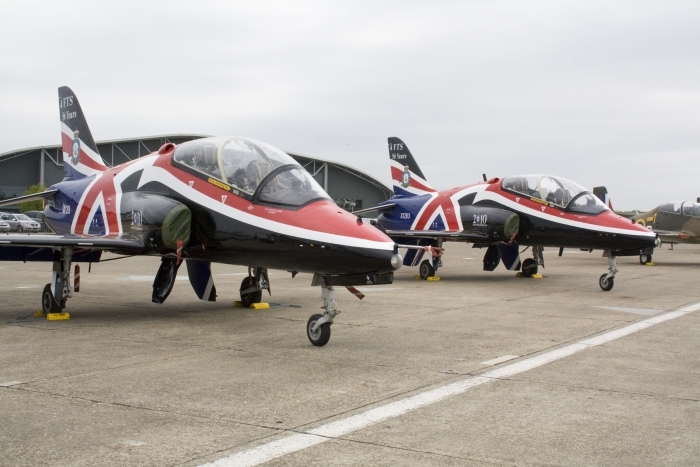 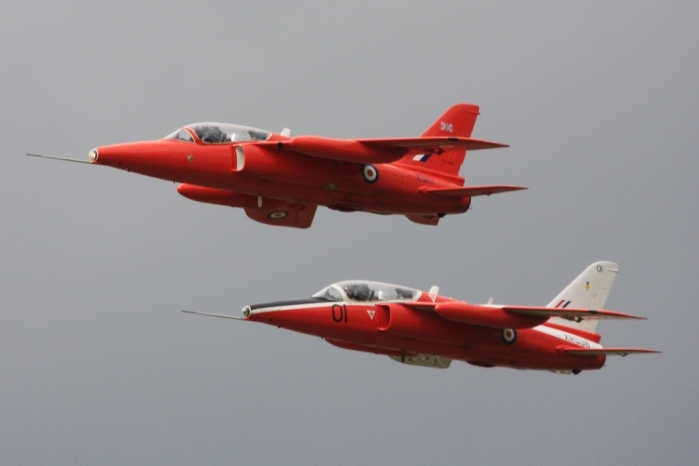 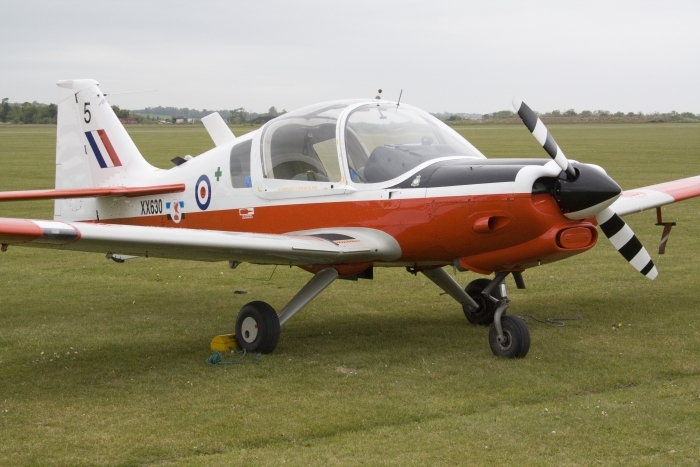 Some of the smaller aircraft included a pair of Foland Gnats from The Gnat Display Team, which brightened things up with their RAF training and Red Arrows colour schemes. 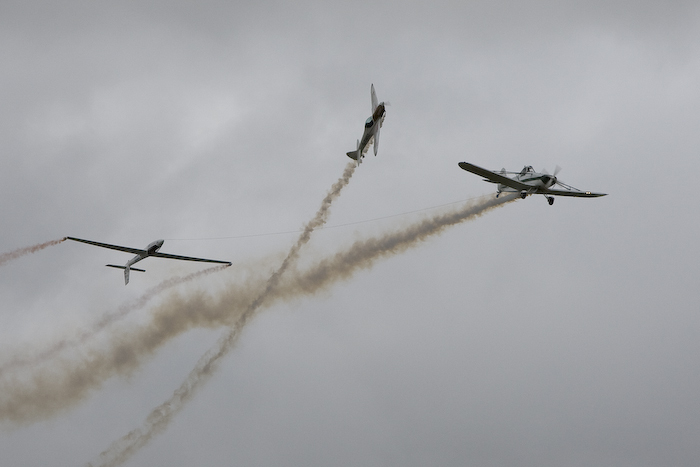 Slowing things down Charlie Brown and Howard Cook put on a well coordinated display with a pair of Chipmunks. 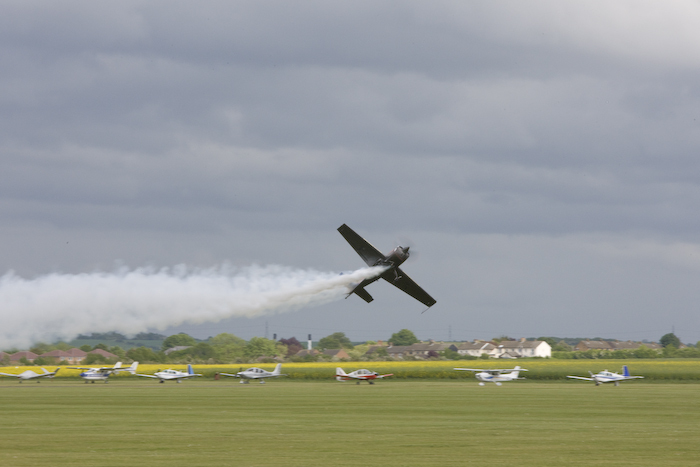 Coming bang up to date, Mark Jefferies (the several times British Aerobatic Champion) put on a stunning display with his Extra EA-330. 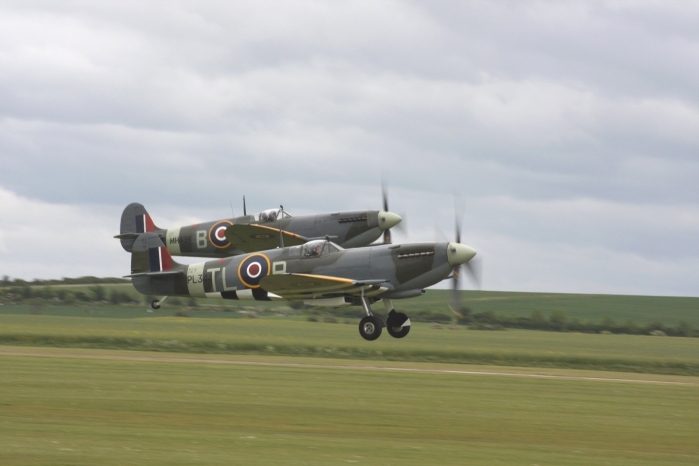 For pure nostalgia, the sound of Merlin engines from a pair of Duxford based Spitfires displaying over this World War II fighter base reverberated around the hangars as the weather once again closed in. 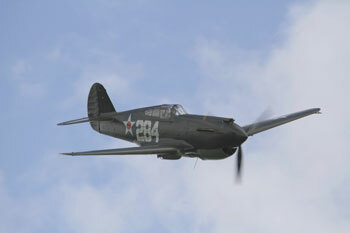 Duxford Spring Air Show 2008, as usual a mix of mainly vintage aircraft with just a touch of new types thrown in for good measure. 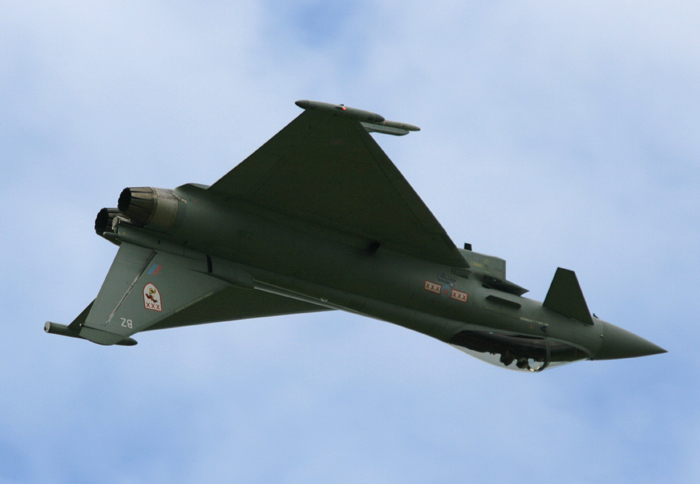 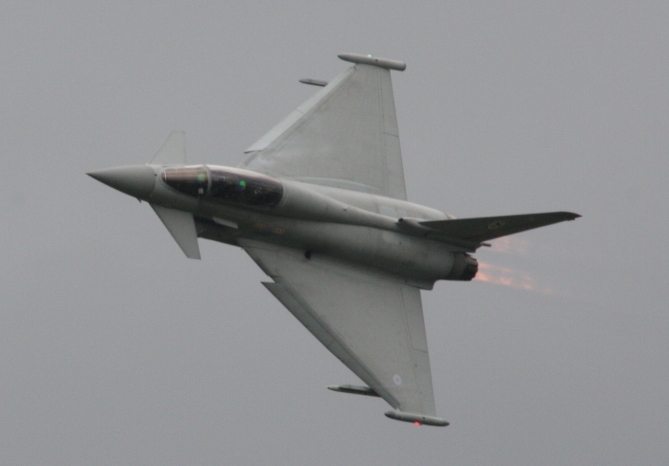 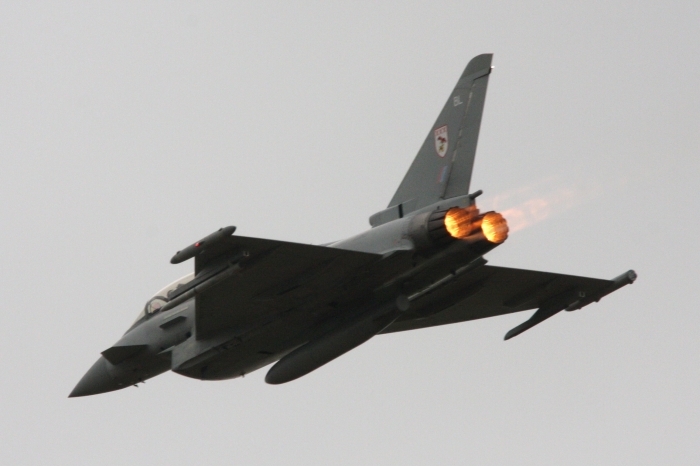 It's surprising what a fast moving Typhoon does to your ears after the dulcet tones of Merlins and big radial engines. 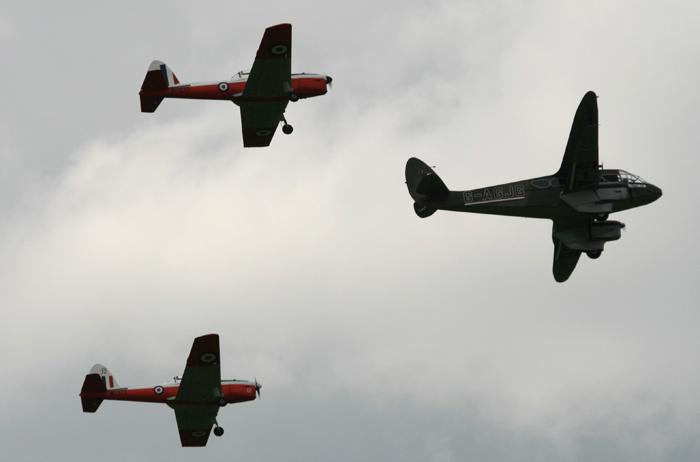 With the usual appearance of The Battle of Britain Memorial Flight with the Lancaster, Spitfire and Hurricane and the classic pairing of Kennet's Seafire from North Weald and The Royal Navy Historic Flight's Sea Hawk, and a leisurely flypast by the Chipmunk pair with the Rapide, two more aircraft from the de Havilland stable. 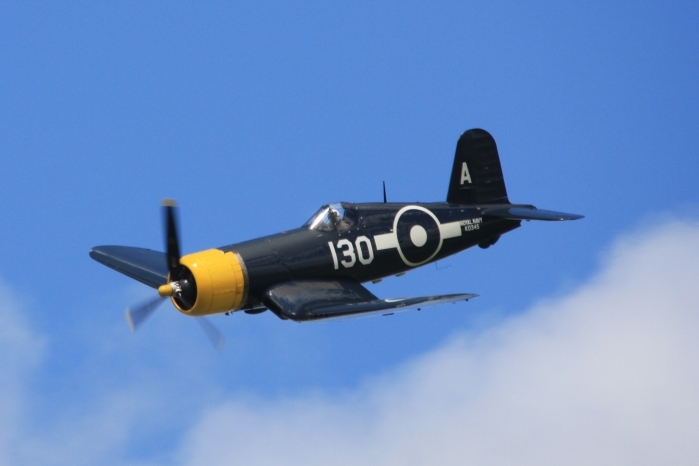 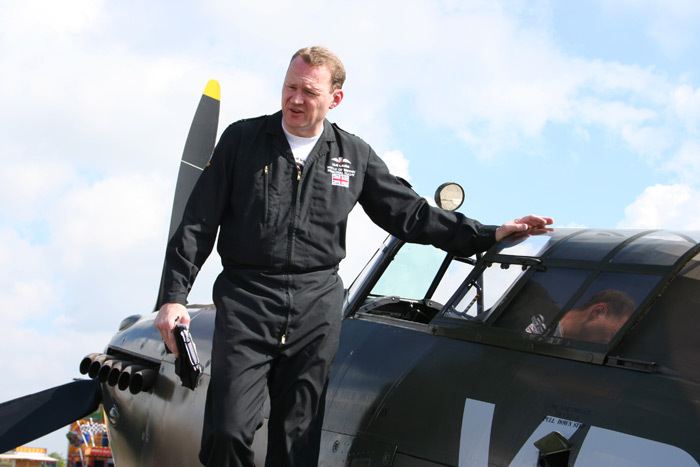 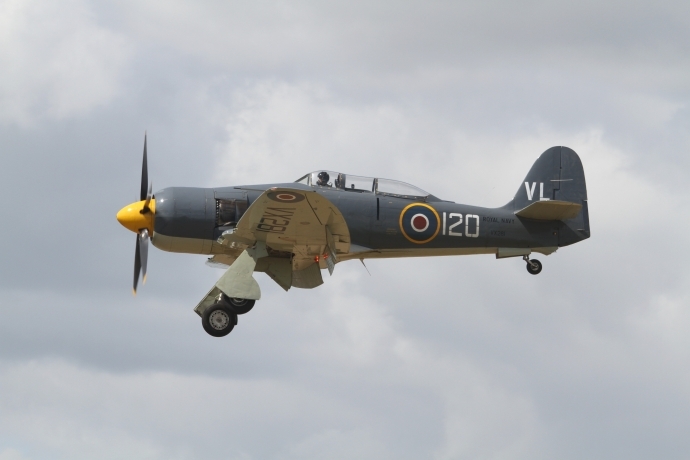 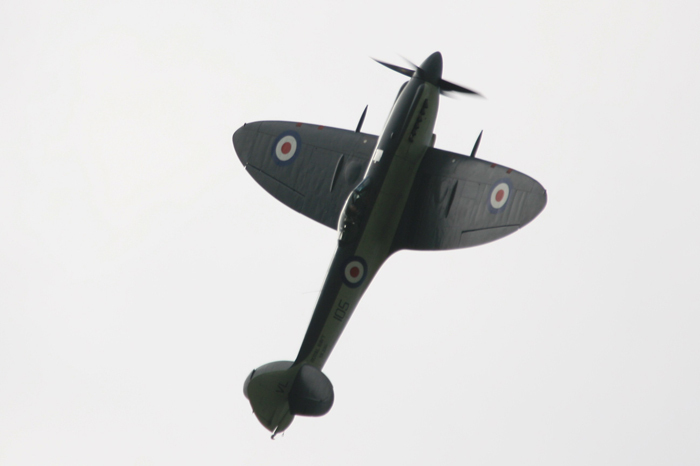 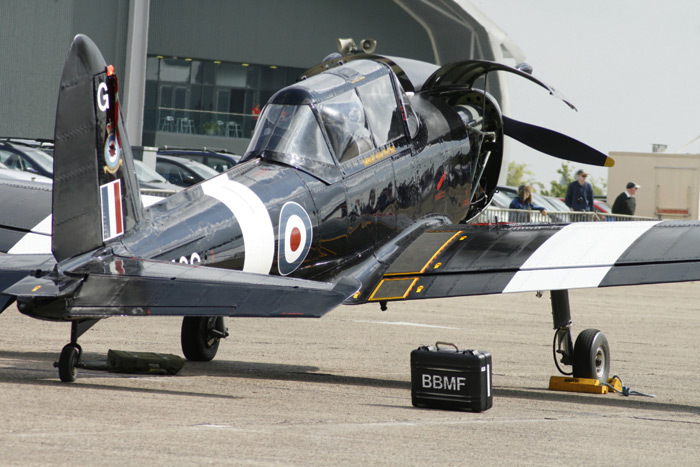 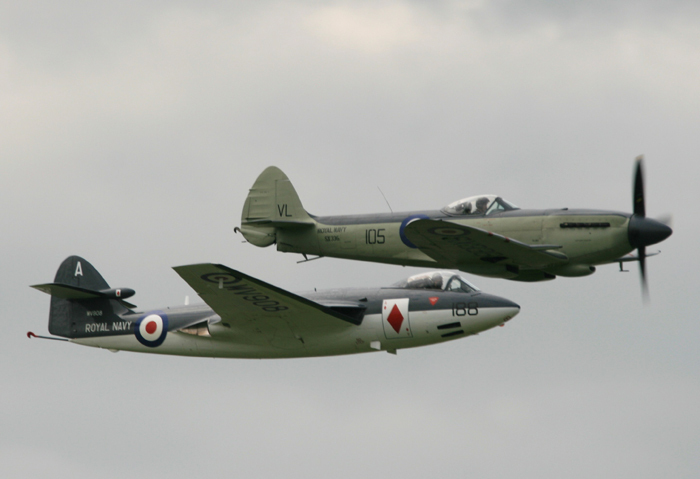 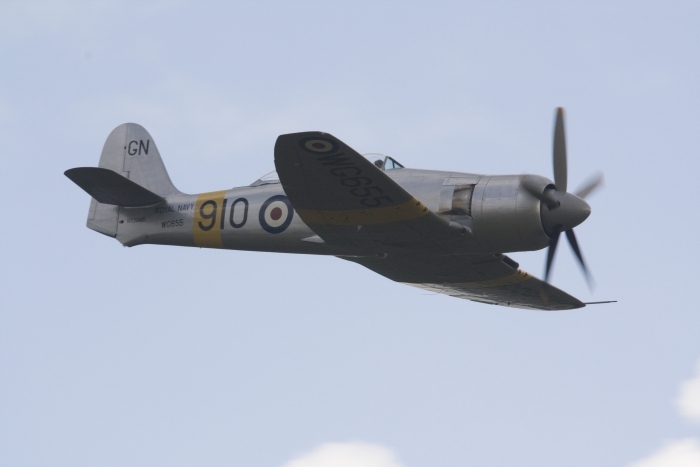 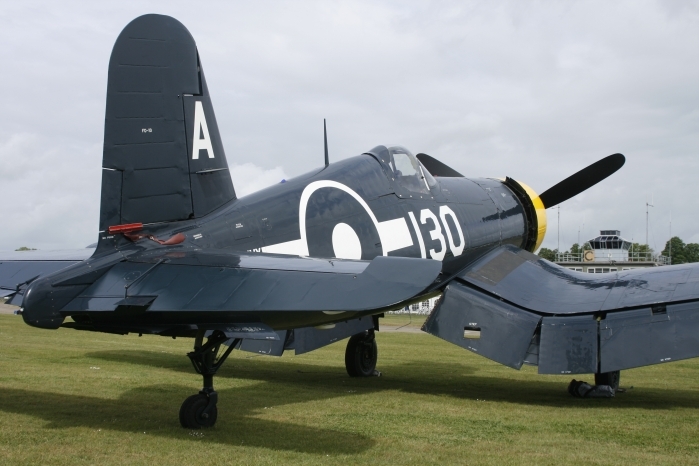 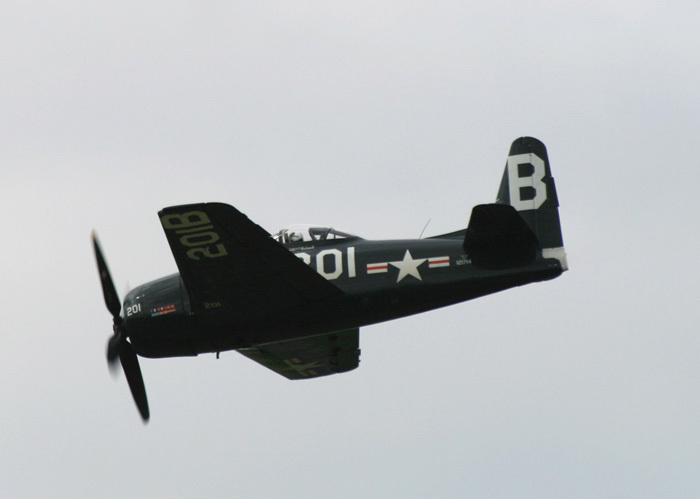 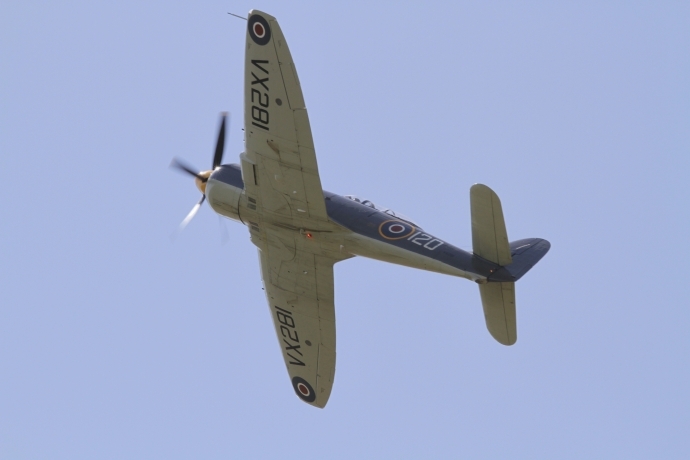 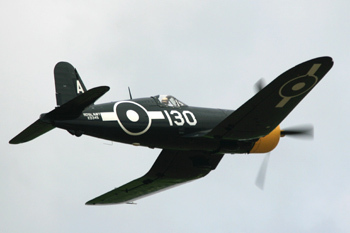 Other aircraft performing were Duxford based Spitfires, the Corsair and the Bearcat. 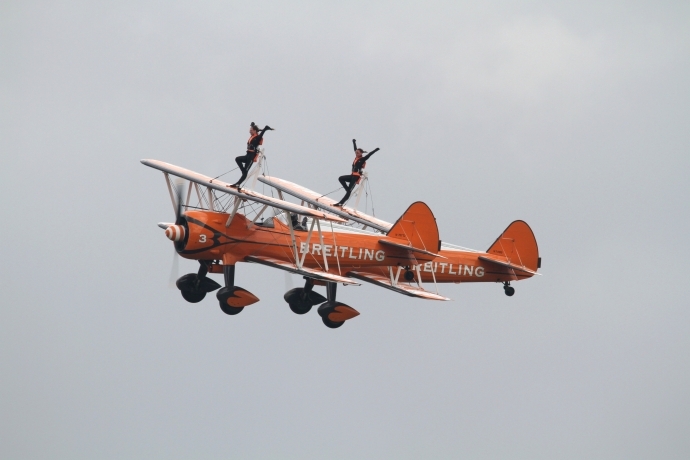 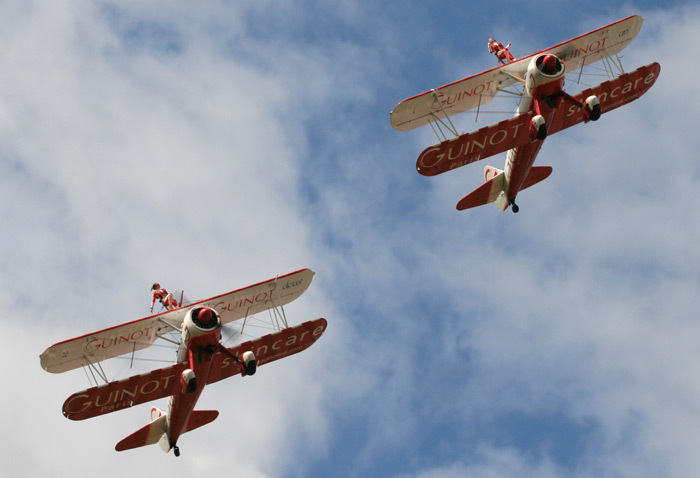 The Guinot Wingwalkers also made an appearance with their young ladies carrying out synchronised acrobatics, and of course Duxford wouldn't be the same without the noise and smoke from Golden Apple's vintage Sabre. 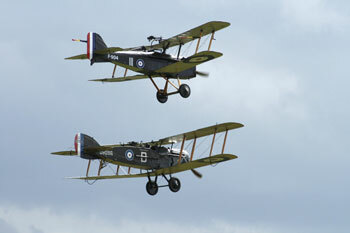 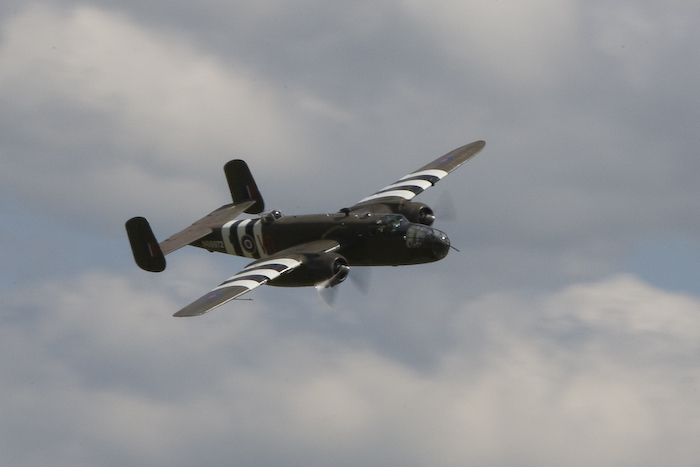 With reasonable weather conditions once again visitors to Duxford were treated to a lively and entertaining day out.